God’s Provision: A Calmer Sea! October 22, 2013 6:36 am / 1 Comment on God’s Provision: A Calmer Sea! And he said to them, “Come away by yourselves to a desolate place and rest a while. Several posts back, we shared how we have been swimming in a sea of busyness these past 12+ months and how we were hoping to soon have some down time to relax and catch our breath. With the completion of our last big event, last weekend’s Young Adult Weekend, that long awaited down time finally arrived during the middle of last week. Other than a few local guest groups over weekends in November, our schedule has slowed down a bit. Of course the “off season” is time to do work projects, promote the camp, and gear up for the winter/spring groups, but it is also time to relax a little and complete personal business. 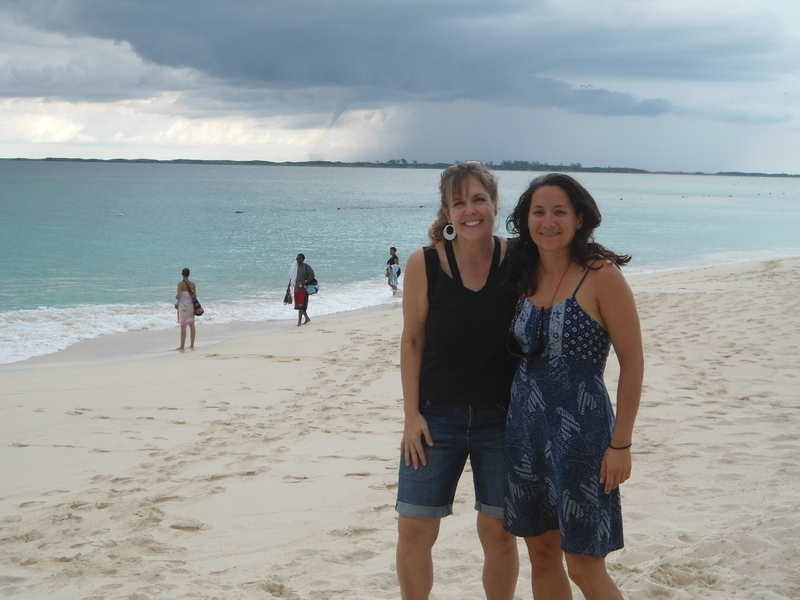 As an added bonus to our “break time” and thanks to a generous gift from some friends, the four of us spent this past weekend in paradise…Paradise Island that is. We had a blast playing in the water together and just relaxing and spending time together. We came home Sunday evening exhausted from all the fun activity, but we are definitely much more refreshed and rejuvenated. We praise the Lord for these little blessings He gives us! 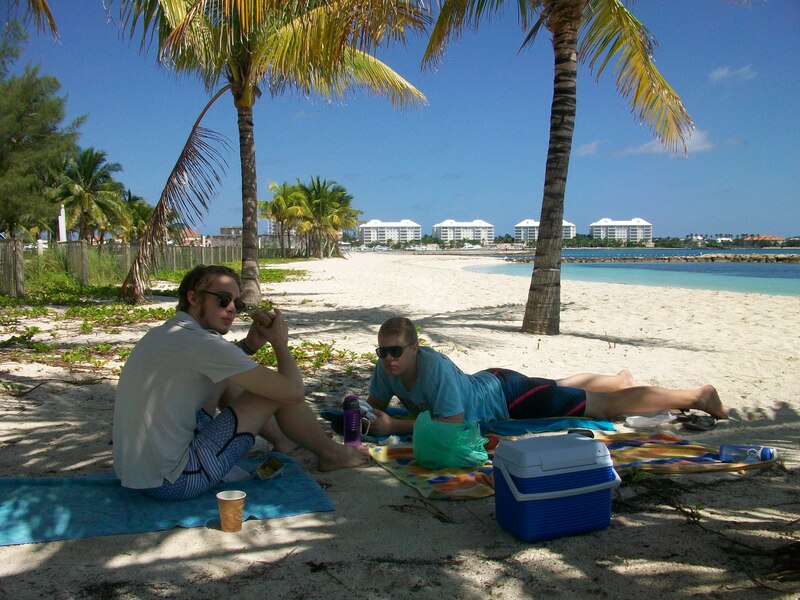 Our weekend getaway in paradise…Paradise Island that is. Someone graciously blessed us with the means to stay at the Comfort Suites on PI. 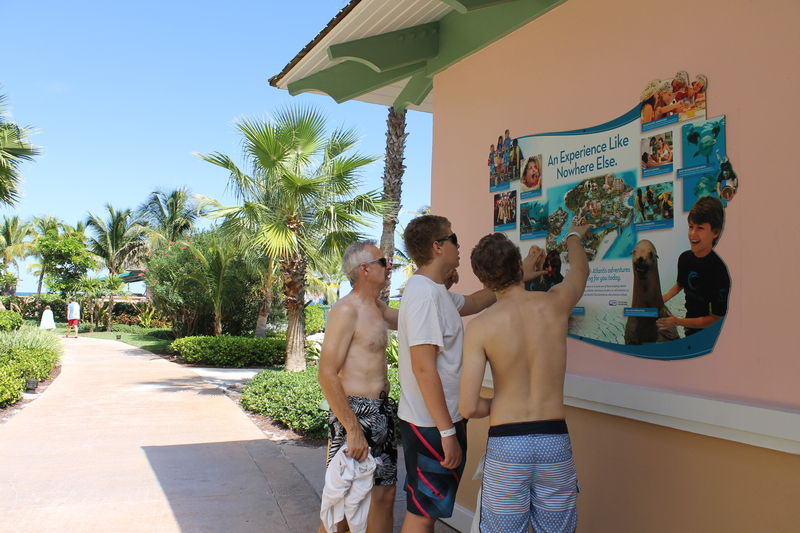 One of the perks of the hotel is full use of the Atlantis water park and pools. We had originally thought we would not share our outing with everyone because we were afraid it might give the impression that we are extravagant with our money and our time, but as we were counseled and as we prayed about it, we felt someone might be encouraged as we shared how God provided for this little “extra” enjoyment. God is faithful and does provide good things to his children. In this case He provided for something we did not ask for, were not expecting, and didn’t know we really needed. Thank you, dear brother and sister (you know who you are), for allowing God to use you in this way! We really enjoyed the time away. 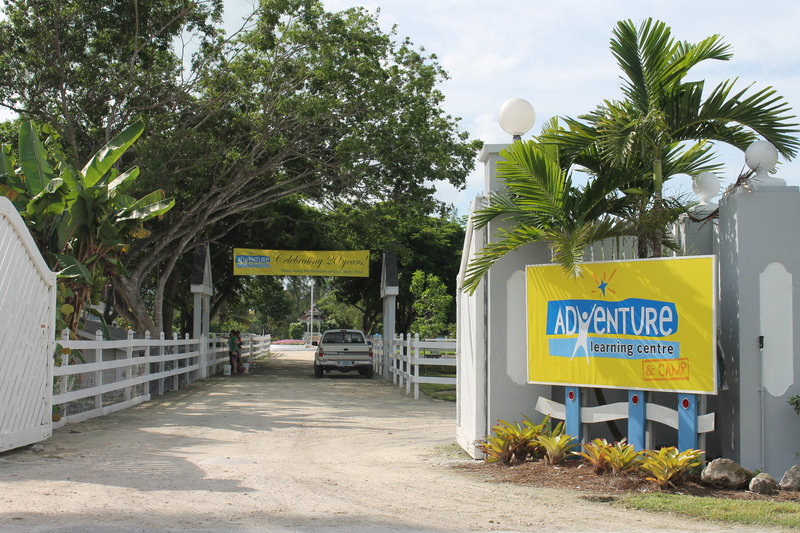 Like us (and the Adventure Learning Centre and Camp) on Facebook! Have you “liked” us on Facebook yet? 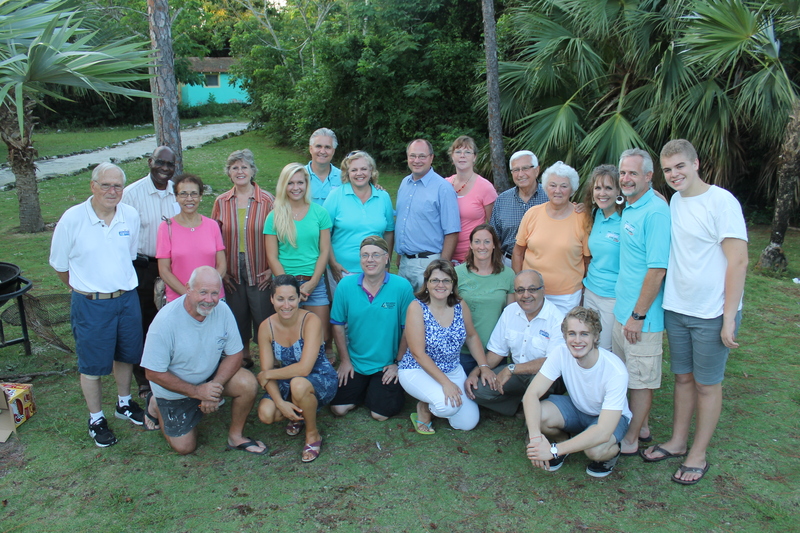 If not, you might want to consider doing so (The Seeley Family Serving in the Bahamas). We have begun to be more intentional with updating our family Facebook site. With that, we have tried to post pictures every couple days, if not every day. Consider checking in on Facebook often to see more up to the date information. 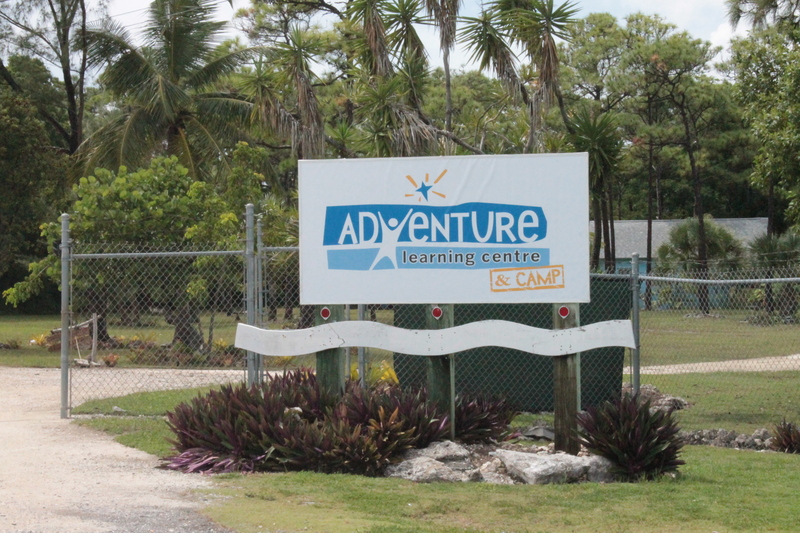 You may also check out Adventure Learning Centre and Camp’s Facebook site as well. We have been attempting to keep that up to date as well. The ALC Newsletter focuses on the ALC updates, prayer requests and information. We try to publish it every other month. Lord willing we will be working on the newsletter this next week. 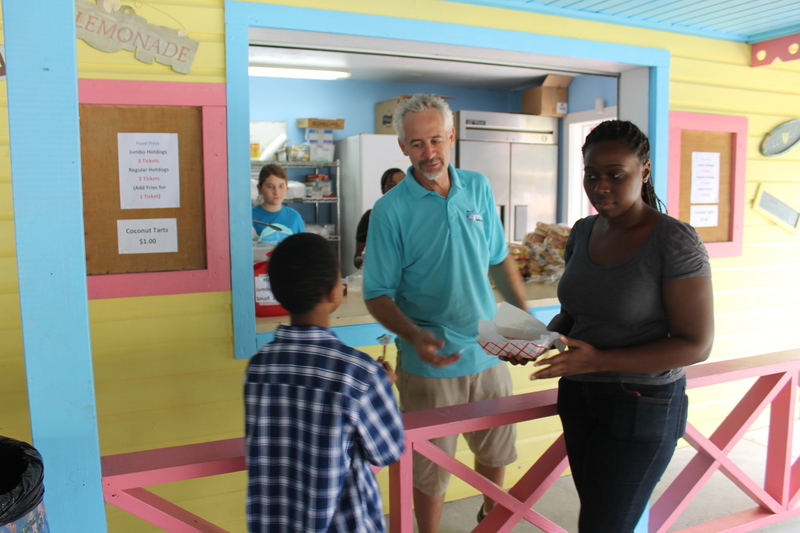 If you have never received the newsletter and would like us to add your email to the list to receive it, email us at tims@alcbahamas.org or mseeleyrn@gmail.com. Let us know you would like to receive the ALC Newsletter. 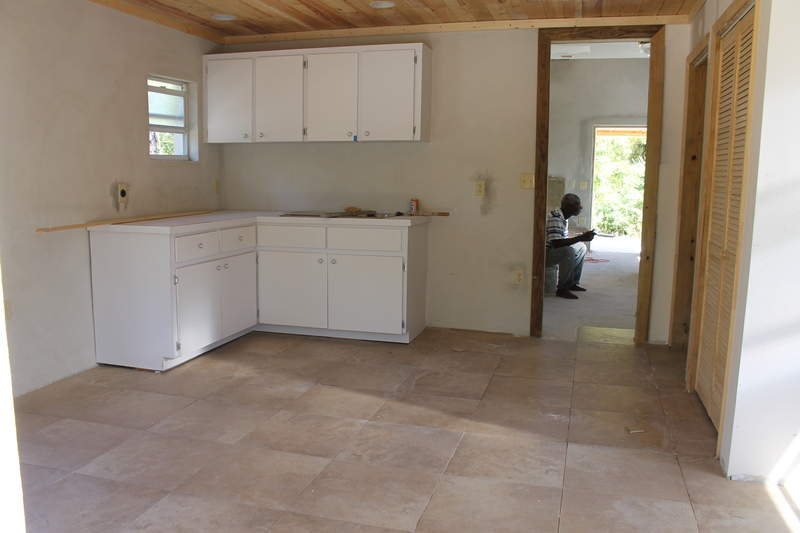 The staff cottage is in the process of being tiled now. It will soon be ready for painting, inside and out. Since neither we nor our maintenance man Tom Schafer have time to do the painting ourselves, please pray that God sends the help needed to get this big project done. The most recent picture of the staff cottage. A picture from the back of the cottage looking towards the front. 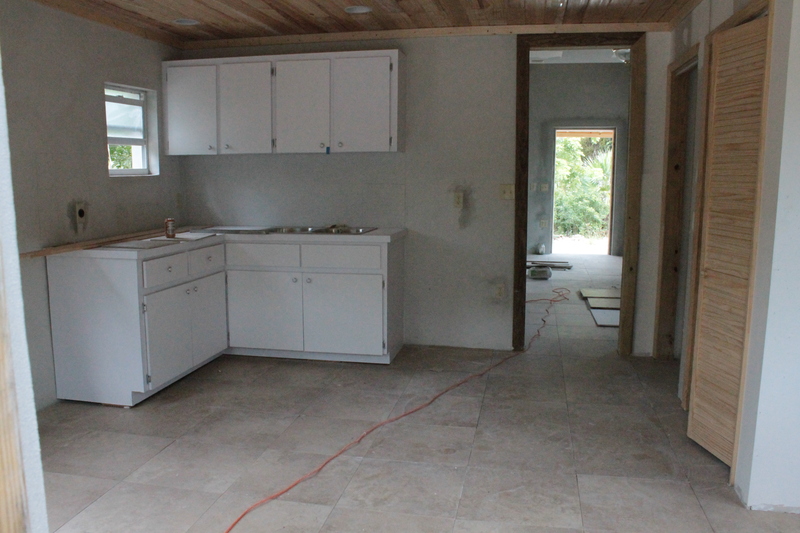 This is the kitchen area. 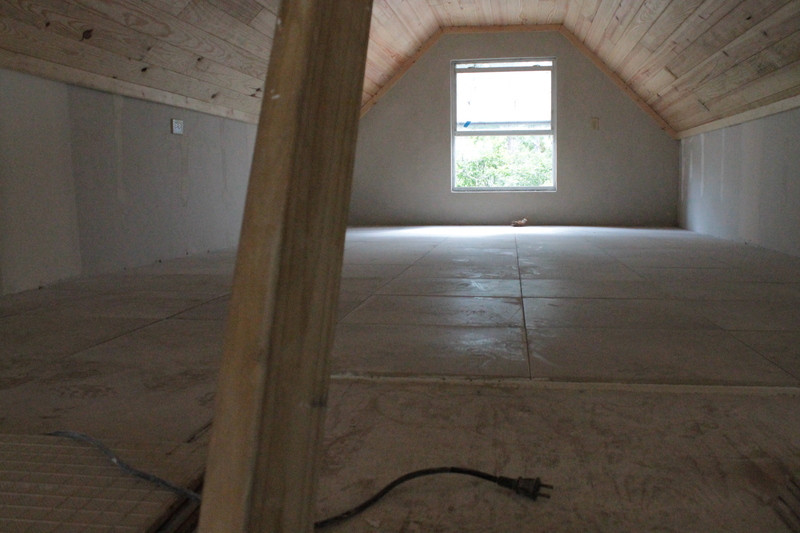 This is the loft area being tiled. This is where the girls will sleep. The electric upgrade is finally finished. Praise the Lord! 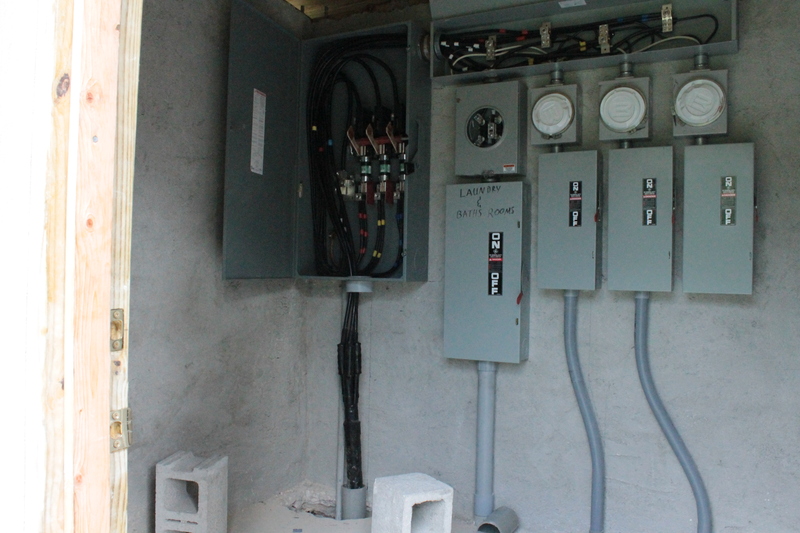 BEC made it out to hook up the last of the wiring and install the meters. We are so glad to have this big project complete. 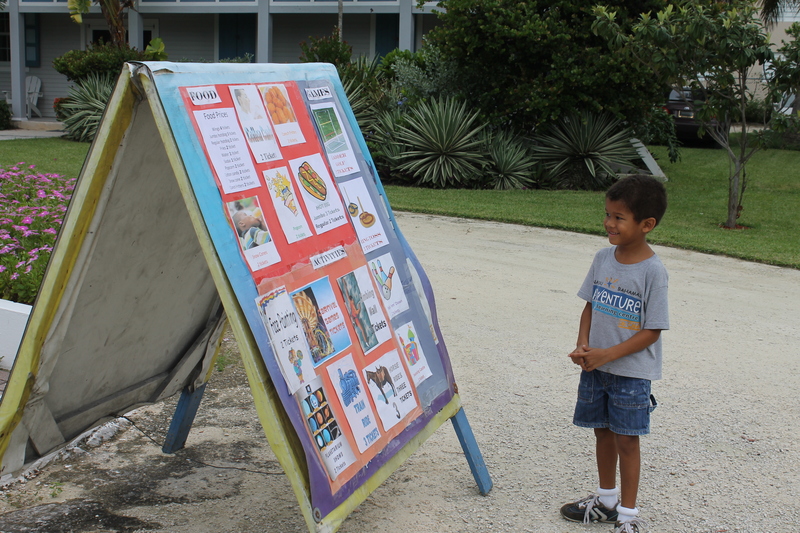 It took a lot of work organizing the project, but we learned a lot through the process. BEC finally showed up. The electric upgrade is now complete. Hallelujah! It was a long road to completion, but it is finally complete and we are so glad. We have learned a lot through this whole process. *Prayer requests are listed after the pictures. A review of the last 2 weeks in pictures! Rarely are we ever alone at our dinner table (and that is exactly how we like it). 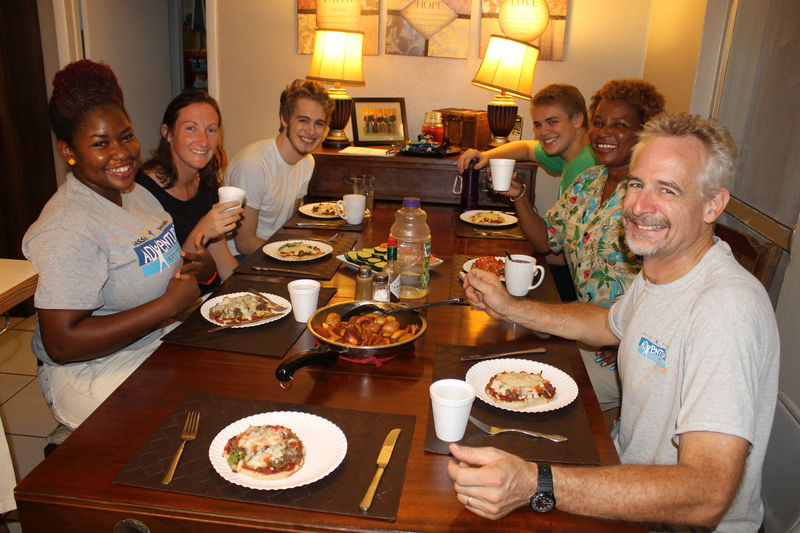 This night we welcomed, Jen, Tika and Lagloria for dinner. 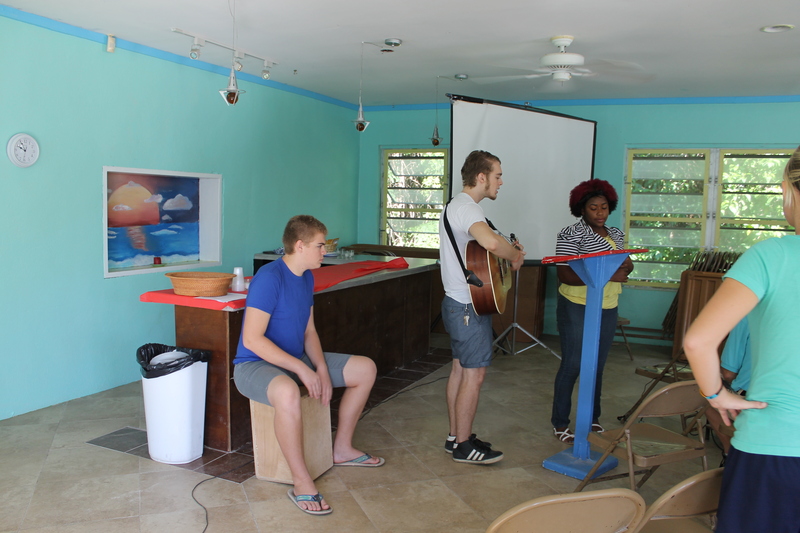 Tika had come to work with Logan on worship songs for the Young Adult Weekend. 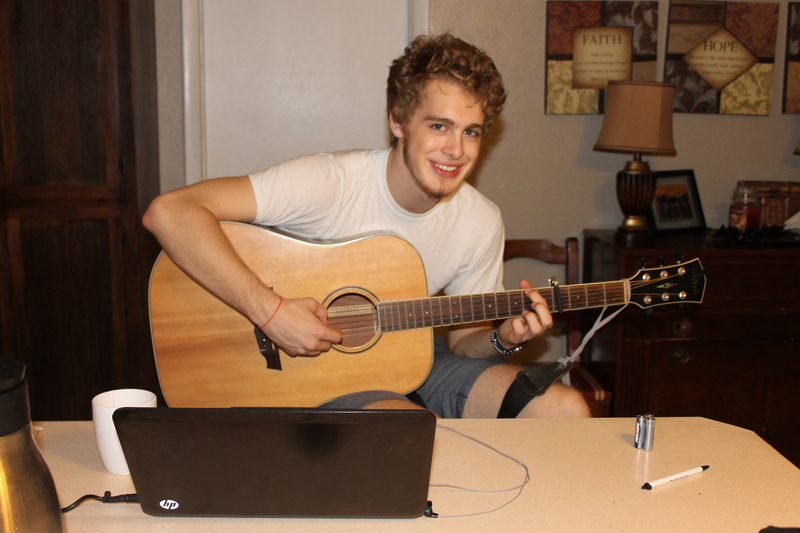 Logan has developed his ability to play the guitar, and because of that, he has been able to help with times of worship at camp and at church. 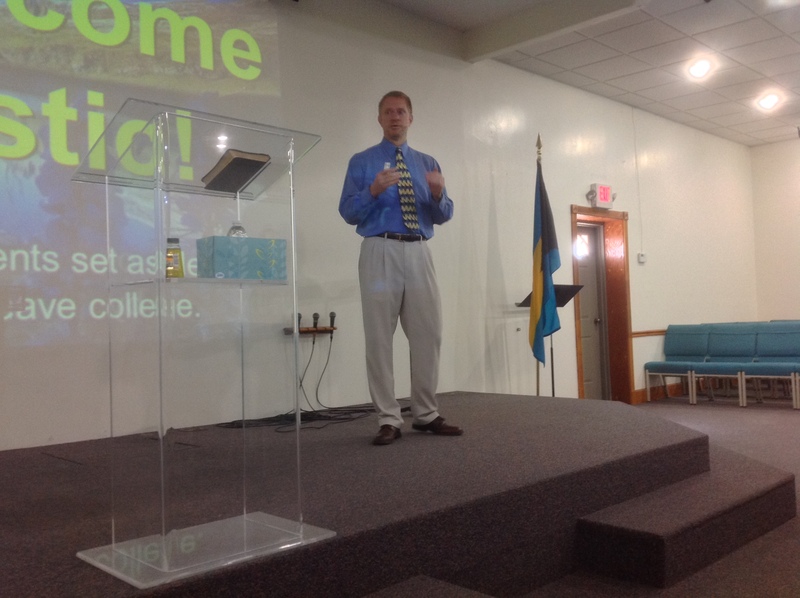 We picked up our Young Adult Weekend speaker, Jay Seegert, and his wife Amy on Thursday afternoon, October 10th. 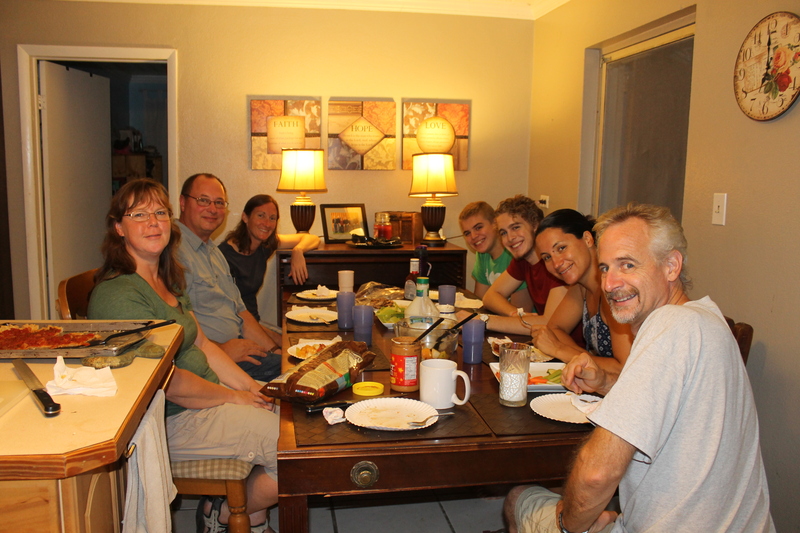 We were able to spend some time talking before dinner that evening. 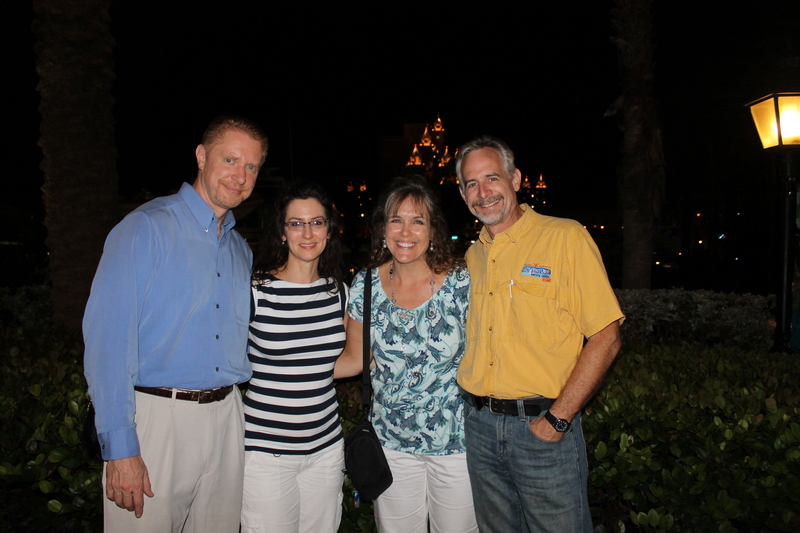 That evening, Mark and Kim Wallace joined us for dinner so they too could get to know Jay and Amy. 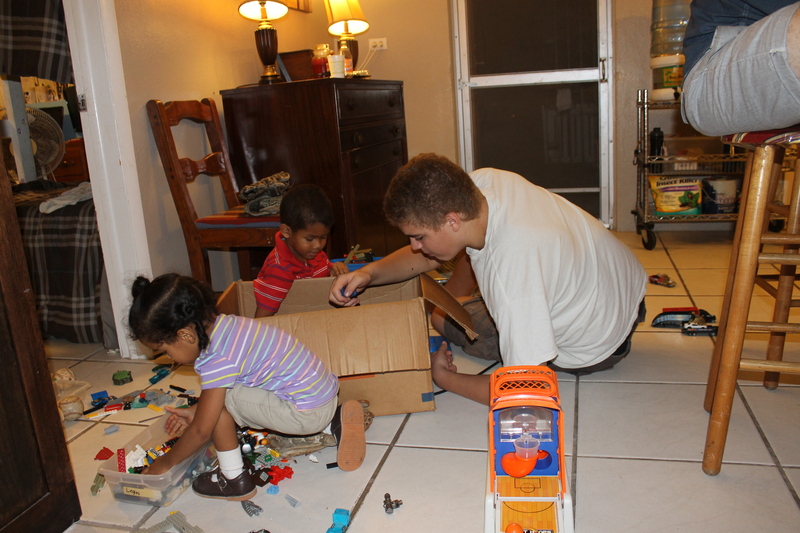 A box of toys that we had forgotten we had brought came in handy for entertaining Adam and Ava Wallace. 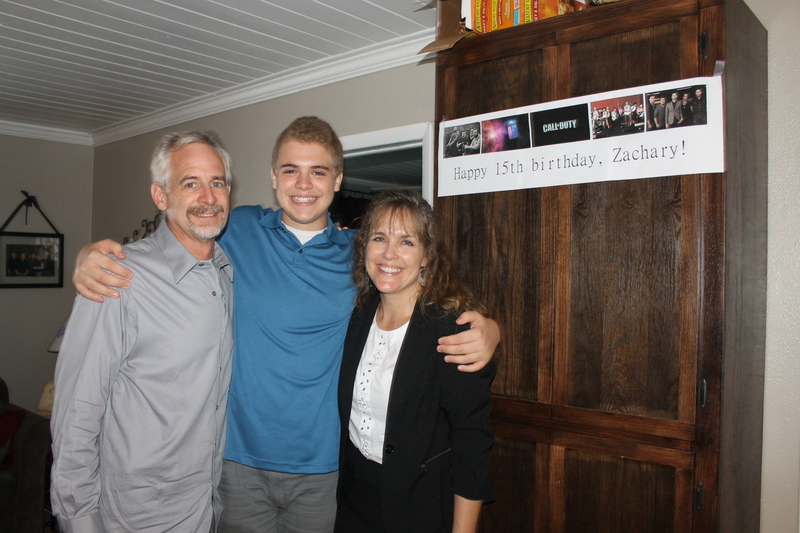 (Zachary was entertained as well!) 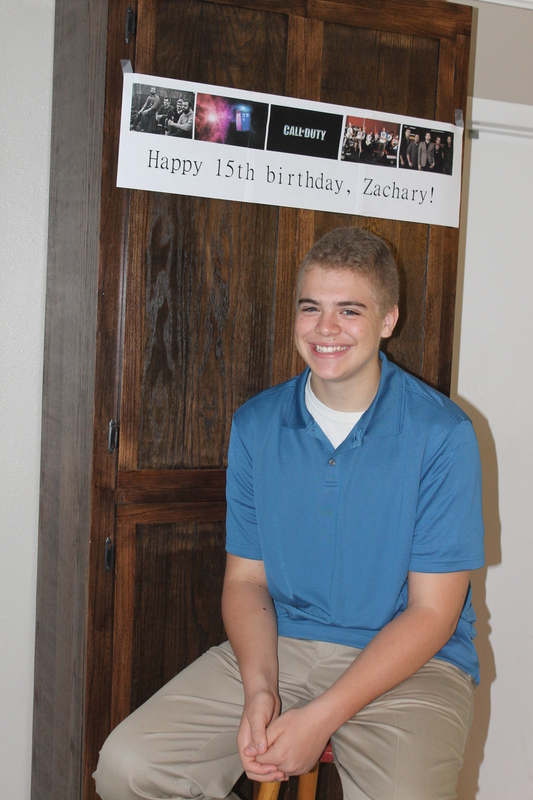 Zachary is such a blessing. He sincerely loves playing with small children. His gift is a blessing to parents of small children. One of our uninvited house guests. 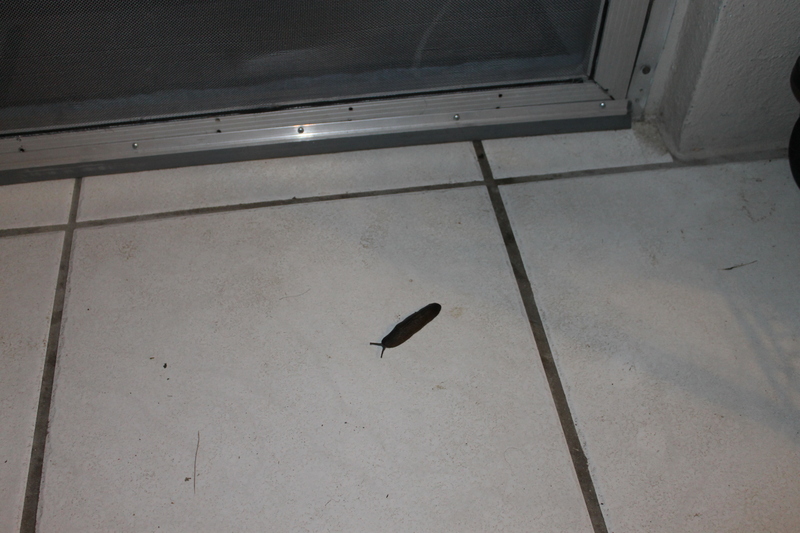 This is a slug. We have found a couple of these in our house. One of the many Bahamian critters we get to “enjoy”. Like cockroaches, they make them bigger here in the Bahamas then they do in the USA. YUCK! 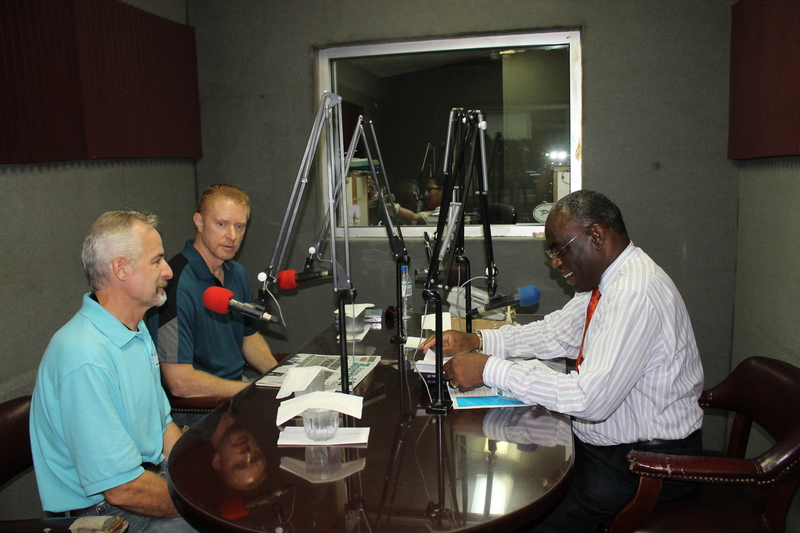 On Friday, Jay Seegert did a radio interview at JCN (a Bahamian radio station). Tim was able to advertise the Young Adult Weekend as well. 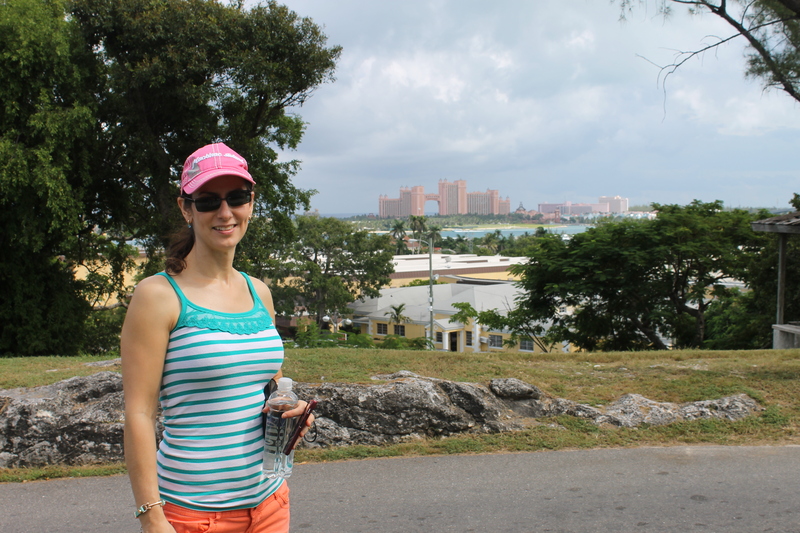 While Jay and Tim spoke on the radio, Mindy took Amy to see downtown Nassau and the Queen’s Staircase. 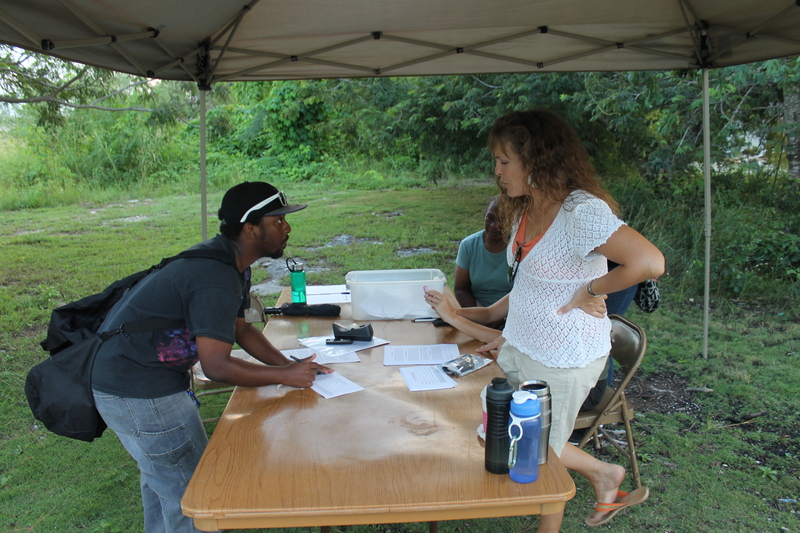 Friday evening, we opened registration for the Young Adult Weekend. Turn out for the weekend was low, but the ALC staff was able to glean a lot of helpful information from Jay Seegert and had a great time of bonding together as a group. 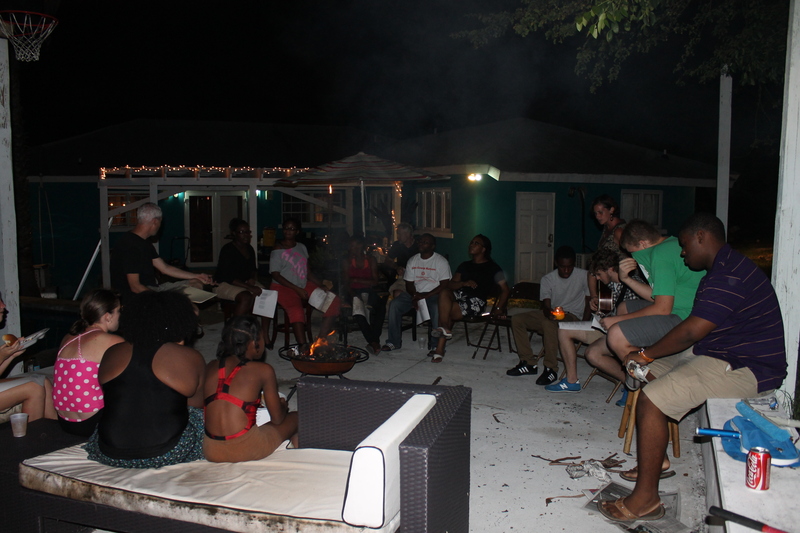 After the Friday evening session, we had a time of refreshment and fellowship along with a chance to unwind around a campfire. 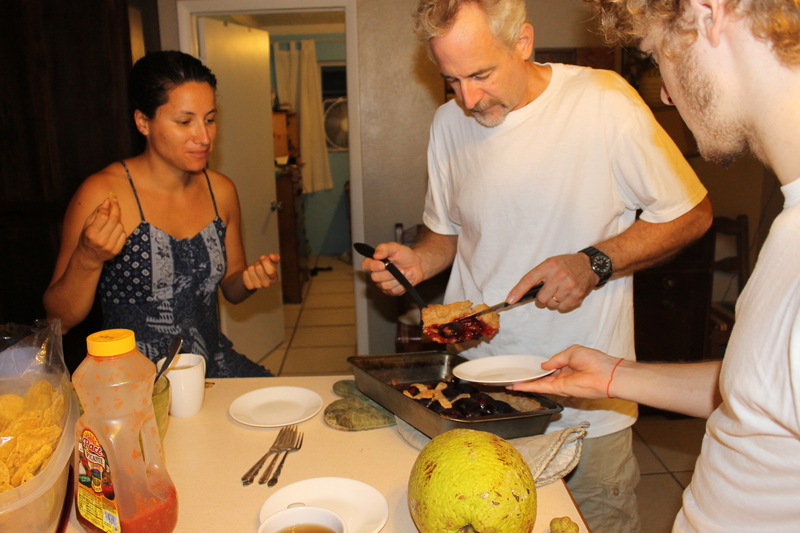 On Saturday morning, after a good Bahamian breakfast of tune, corn beef, and grits (yummy!) made by our very own Ms. Aida, we began the session with a time of worship led by our very own TIka Penn, Logan and Zachary. Ms. Aida was in the kitchen and missed the call for the group picture. 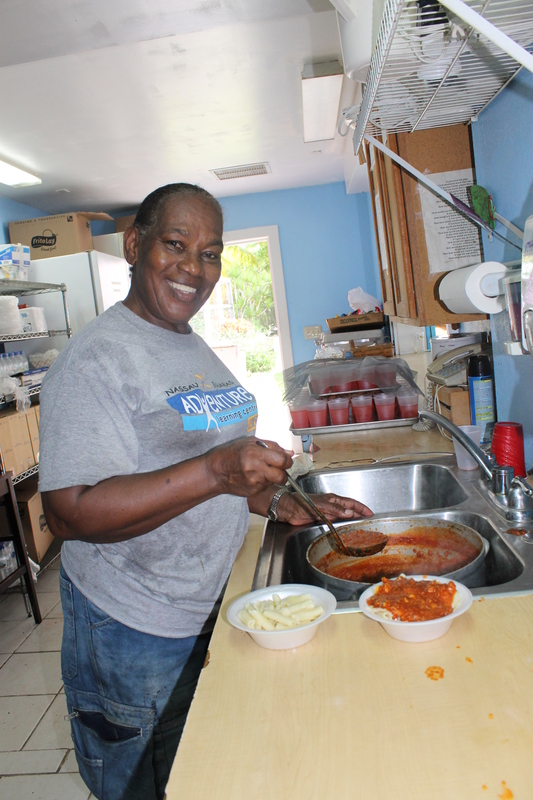 True to fashion, she treated us all with her famous Bahamian cooking. What a treat! 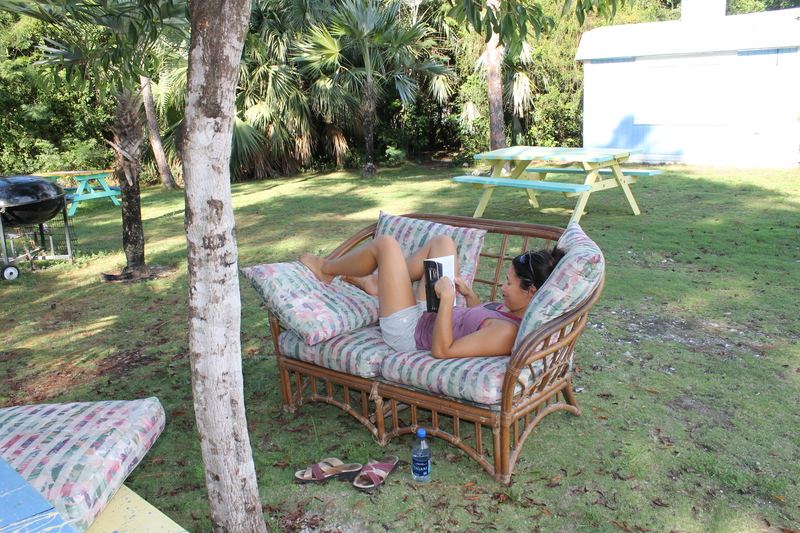 …while others relaxed reading the speaker’s book. We enjoyed hosting the Seegerts and gleaning so much information from Jay’s presentations. On Sunday, Jay spoke at Kingdom Life Church. 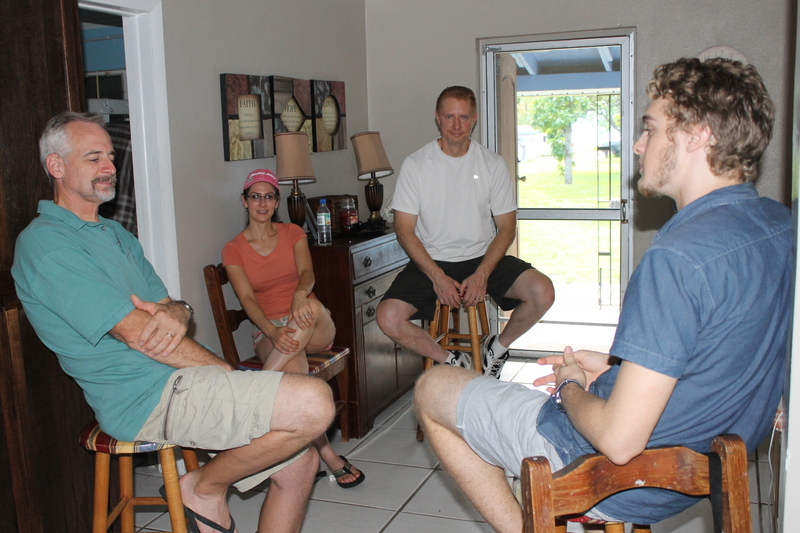 After Jay spoke in the am service at Kingdom life, we met at our pastor’s house. This was the young people’s table. 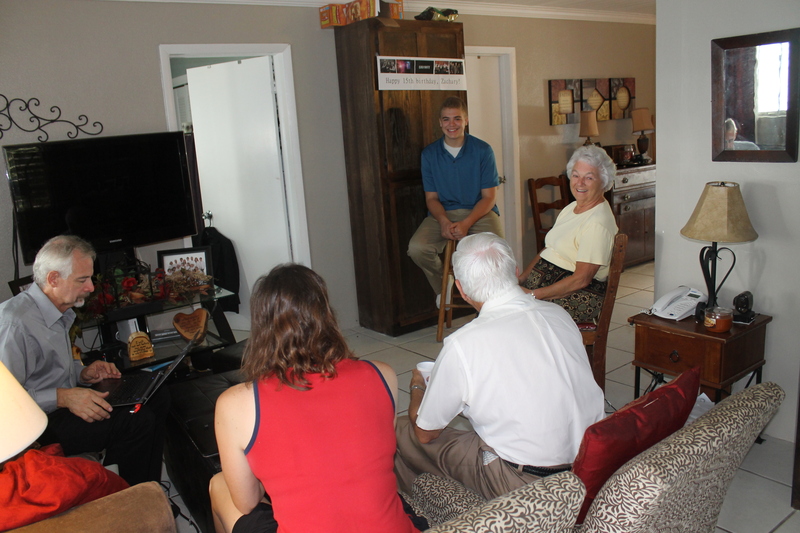 From left to right is Keaton and Kendall Bunting, Deborah (pastor Cedric’s niece), Logan, Zachary, Kara Bunting, and Abby Moss. This is the adult table. 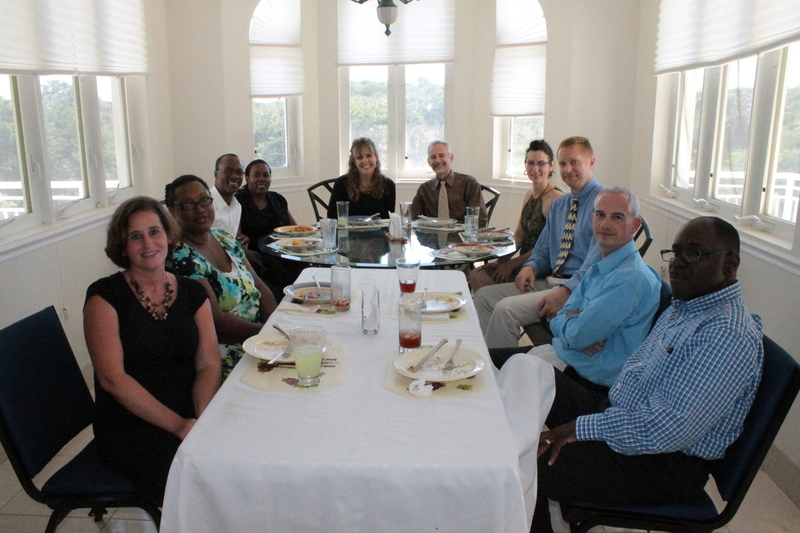 From left to right: Kristin Bunting, Antja Humes, Cedric and Alexine Moss, us, Amy and Jay Seegert, Keith Bunting, and David Humes. 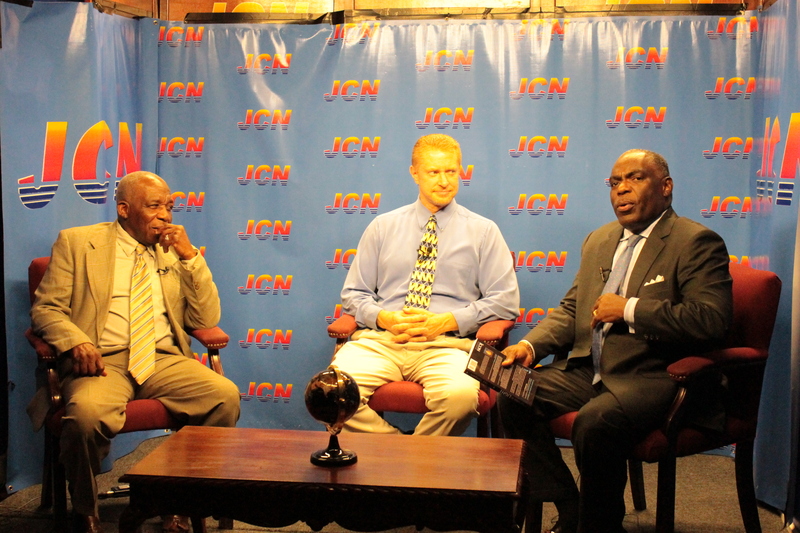 On Tuesday, October 14th, Jay participated in the taping of a television interview. 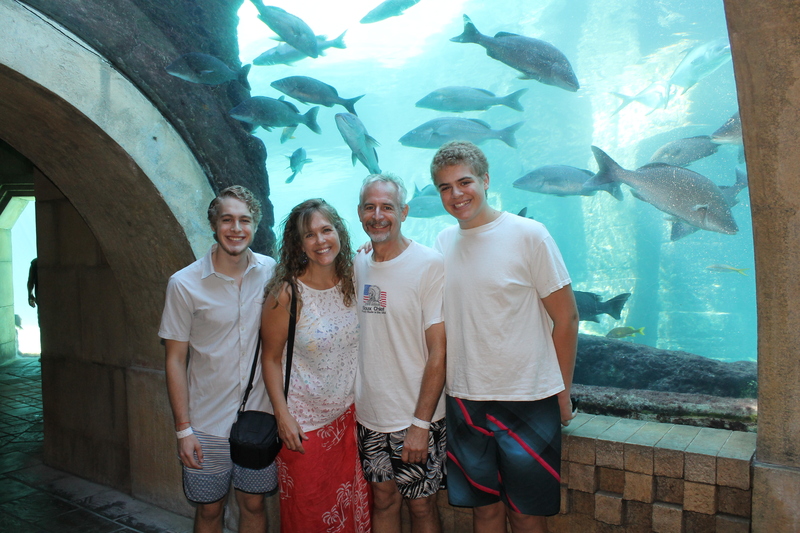 After the television program taping and dinner at Montague Gardens (one of our favorite restaurants), we took Jay and Amy to Marina Village and to see Atlantis’s “Dig” (aquarium). Mindy dropped Jay and Amy off at the airport on Wednesday around 2pm and picked-up our newest ALC facilitator, Michelle. 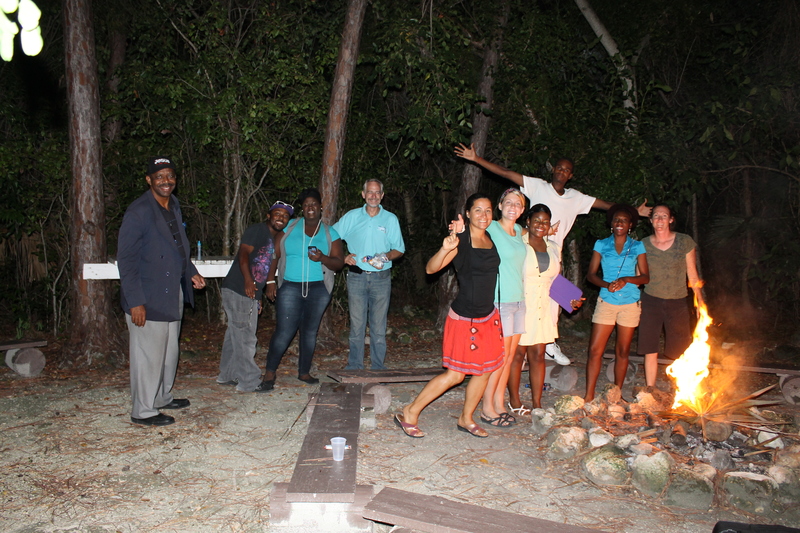 We had all the ALC facilitator staff for dinner that evening to meet and great Michelle for her first night on the island. She is from (where else?) Wisconsin and will be with us for the next 5 months. 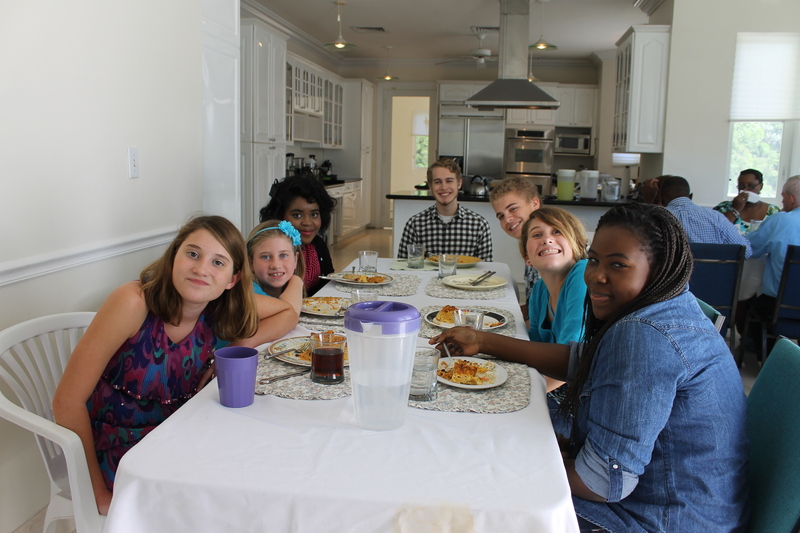 From left to right: Logan, Elton, Zachary, Marion, Sam, Julia, Michelle, Tika, Jen, Tim. 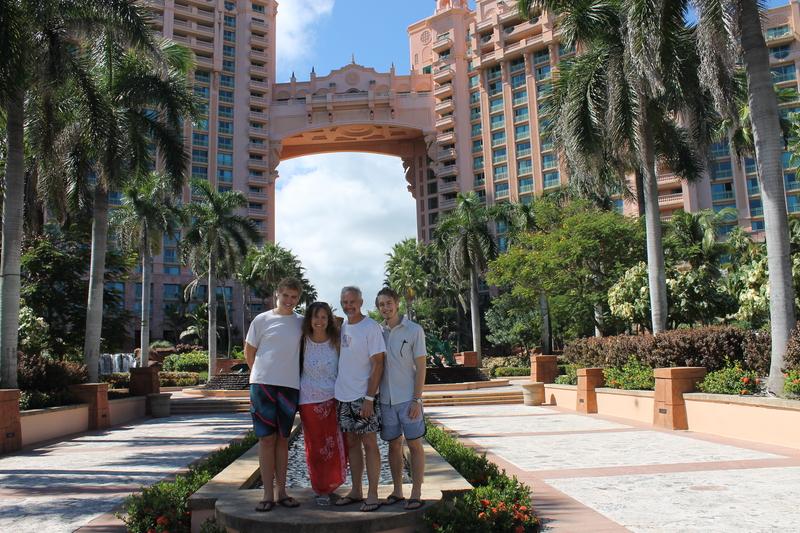 For our weekend getaway, we stayed at the Comfort Suites on Paradise Island, right next to the Atlantis Hotel. One of the perks of staying at the Comfort Suites is full use of Atlantis hotel’s water park and pools. 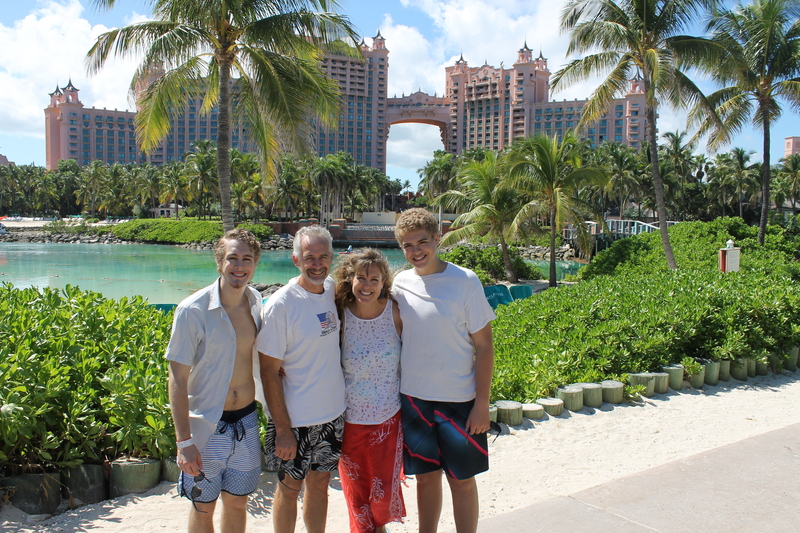 After checking in Friday morning (our room was ready by 11am), we changed and made our way over to enjoy Atlantis. 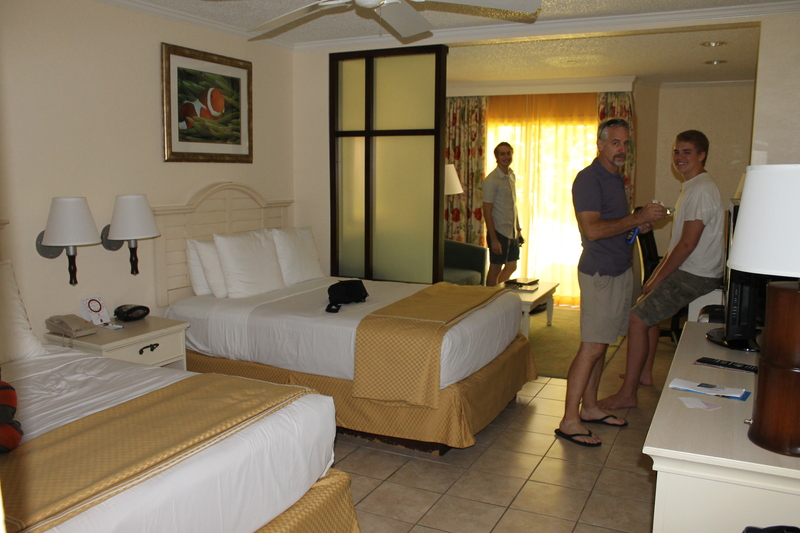 Besides not having to pay for the weekend (someone generously blessed us with this getaway), we were able to get this room at a much smaller rate because we are residents of the Bahamas. 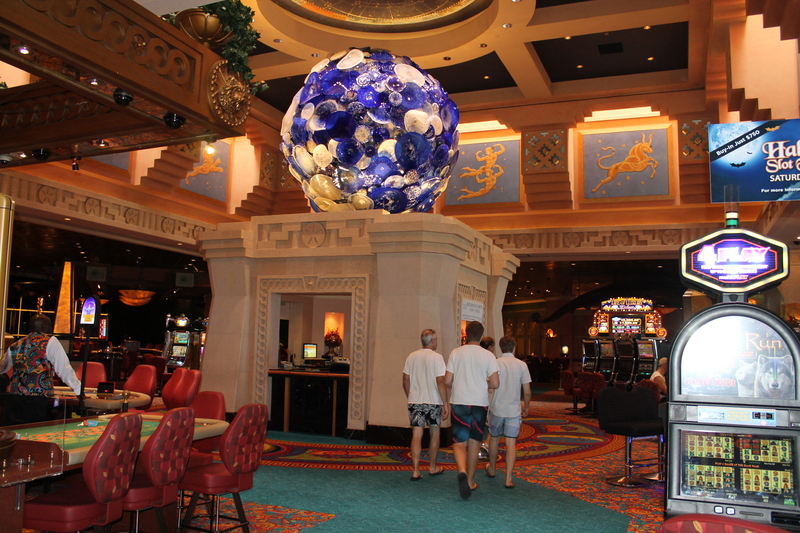 This is the casino area of Atlantis. You have to walk through it to get to the Dig. One of the art pieces on display is this “sun” sculpture. It is gorgeous. This is the “moon” sculpture. 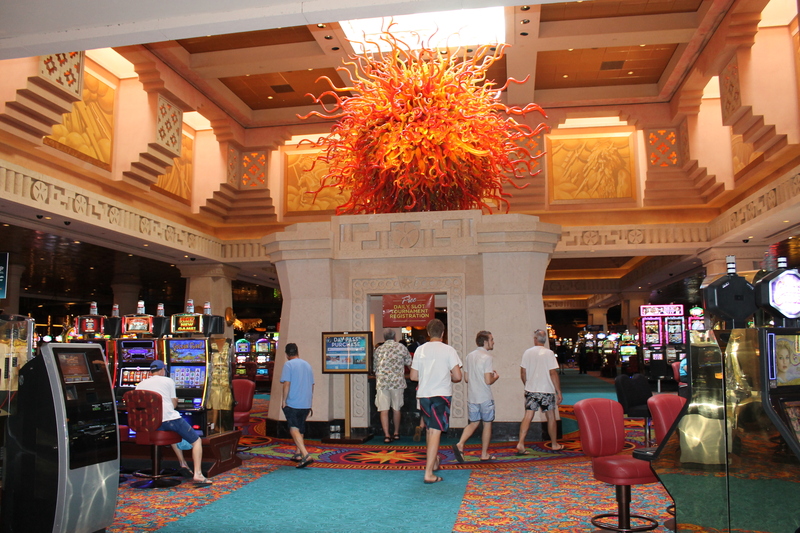 Since we never come to the Atlantis during daylight hours (you cannot get in unless you have a wrist band), we were amazed at how different the aquarium looks during the day as opposed to the dark of night. 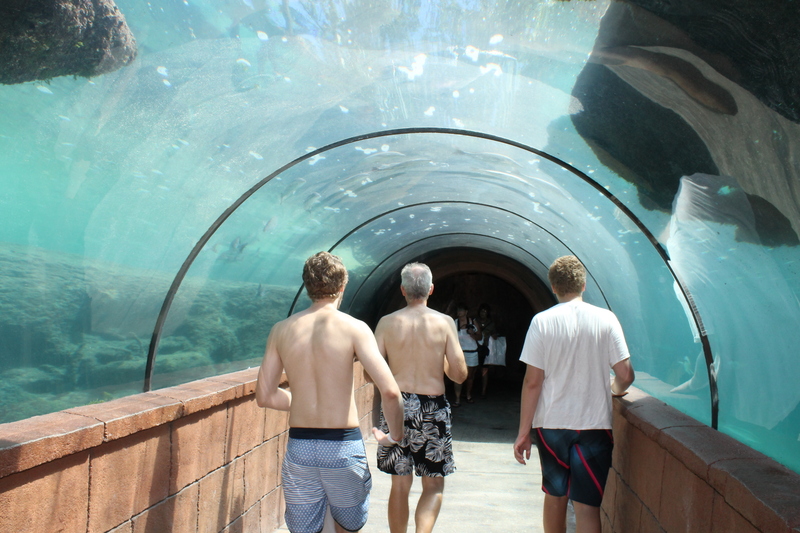 This is the entry into the “Dig” area (Atlantis’s aquarium). The aquarium truly looks different in the daylight than it does at night. This is the Atlantis Bridge Suite. We hear it is quite spendy to stay in that suite. We have never had a photograph of it in the daylight. We have tried to take pictures here before but they have never turned out because it was always dark. 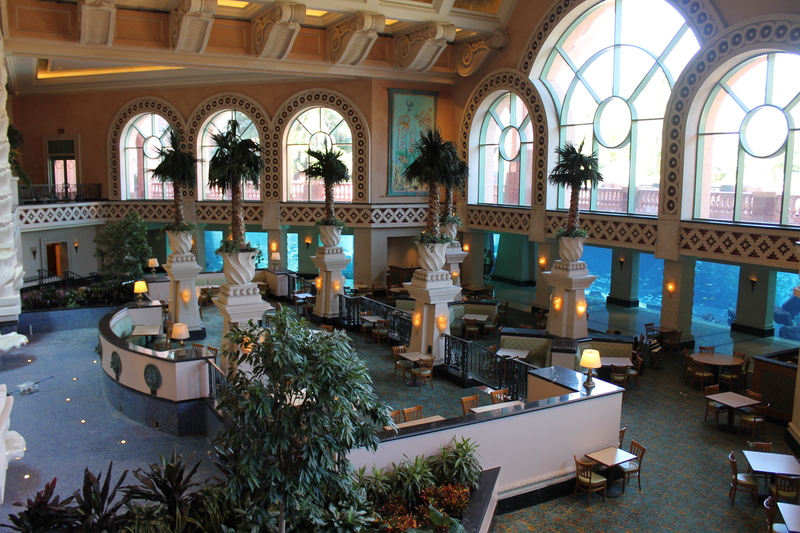 The Atlantis resort is massive. We were trying to get our bearings and see where everything was. 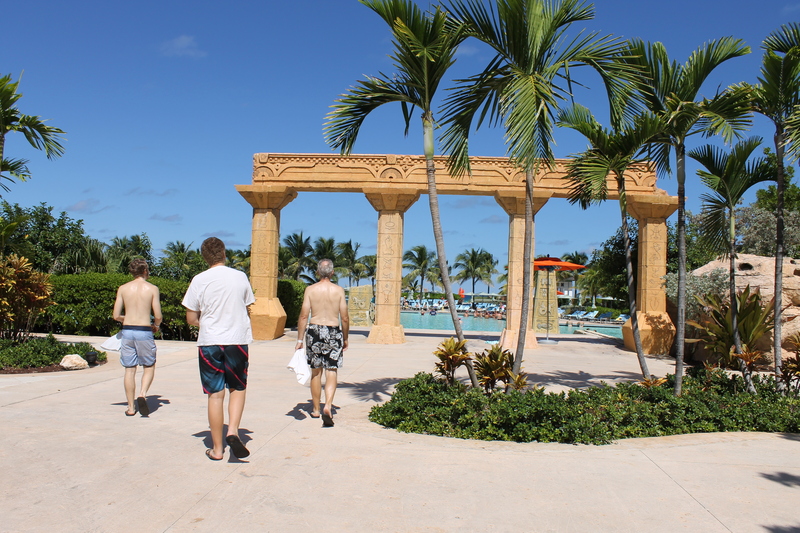 One of the many pools…carrying on the Atlantis theme. Another area that looks totally different during the daylight hours. This is predator’s tunnel. There are sharks swimming everywhere. Totally cool! 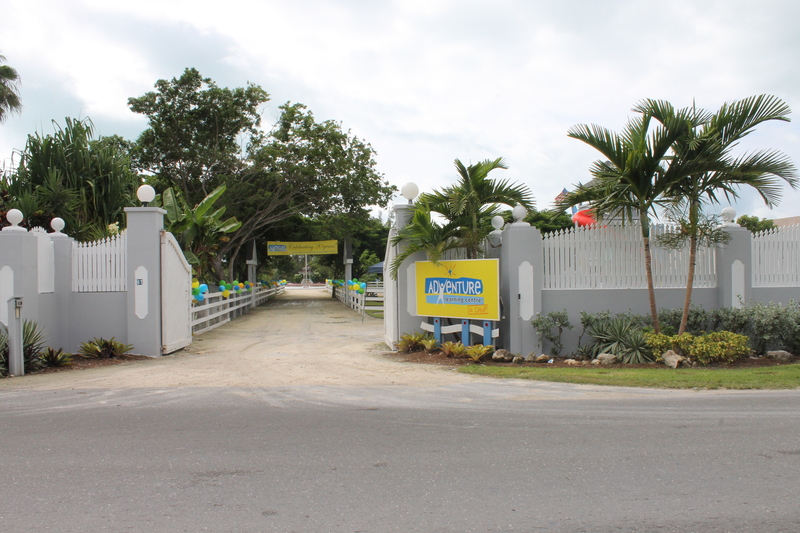 Before we planned our getaway to Paradise Island, we had made plans to attend Kingdom Life’s movie night on Friday. So that evening we went to church for movie night. Before the movie was a time of food and fellowship. Many ALC staff came to the movie night at Kingdom Life. 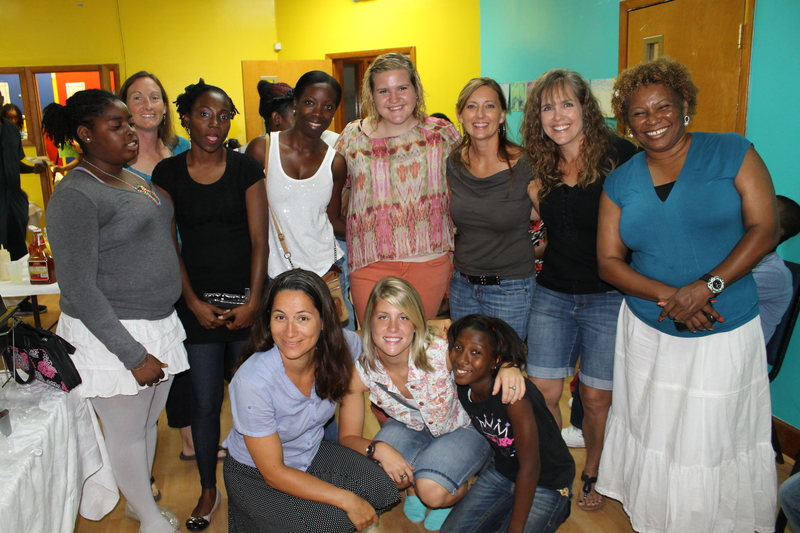 From left to right/front to back: Marion, Julia, Alex (couple of the Kingdom LIfe young people), Katie, Jen, Sam, Charmaine, Michelle, Felicia, Mindy, LaGloria. 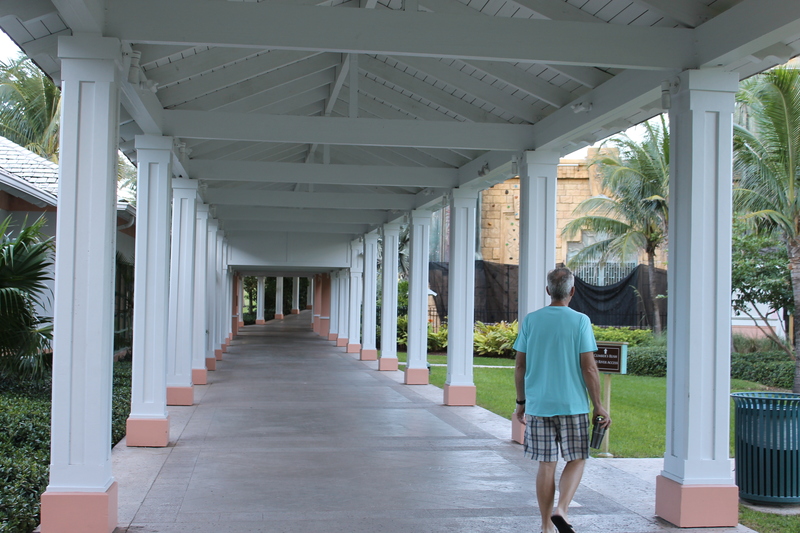 On Saturday morning, while the boys slept in, we took a walk through the Atlanis grounds to see parts we had never seen before. This is over by “The Cove” and “The Reef” towers. After our morning walk, we ate breakfast together at the hotel before venturing out to the water park for a day of fun. 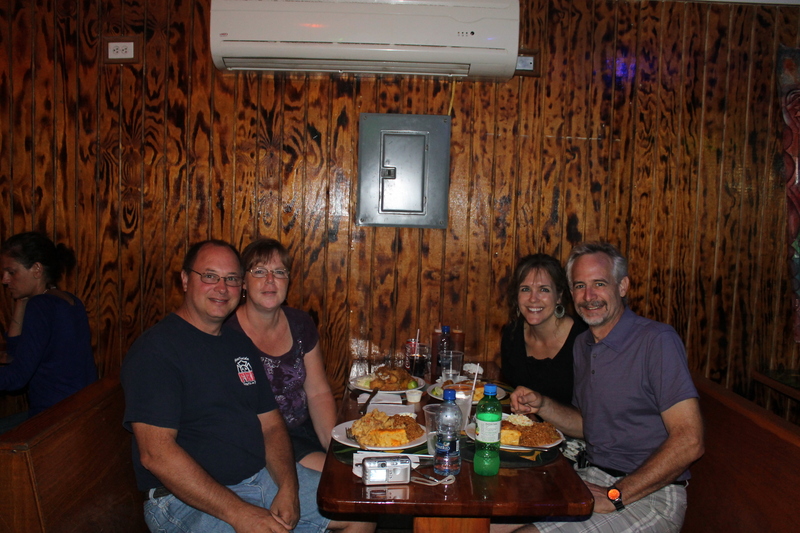 After a day of play at the water park, we went to one of our favorite restaurants on PI, The Green Parrot. This is the sunset view we enjoyed as we ate our dinner. 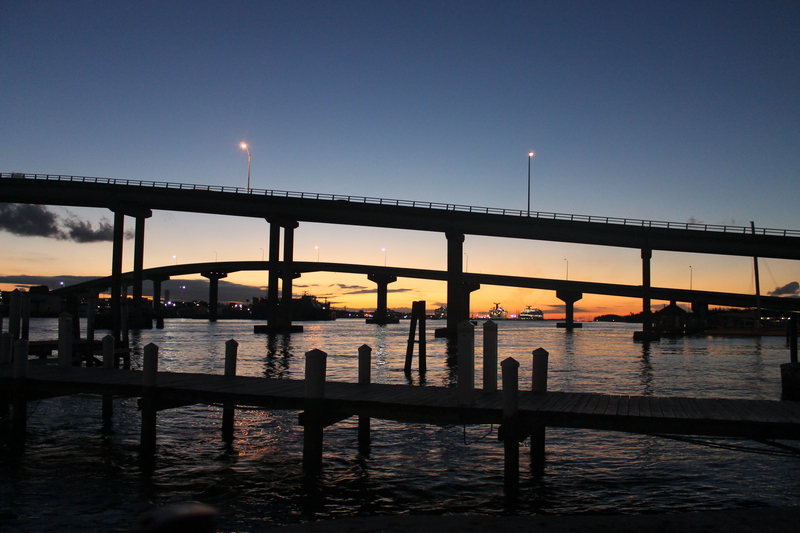 This is a picture of the 2 bridges leading to and from Paradise Island. The far bridge is the entrance bridge and the near bridge is the exit bridge. The “relaxation” (not really relaxing but definitely a diversion from ministry work) of this past weekend have served us well. We praise the Lord for these times away; they are much needed. *The ALC facility is falling apart in many places because of age and use. Please pray that God sends the help needed (financial provision and man power) to repair/replace things! Also, our maintenance guy will be gone for the next week and then again for 2 weeks in November. Pray for Tom as he rests and recuperates, and pray nothing breaks down here while he is gone. Thank you for taking the time to read this blog. We sincerely appreciate your interest in our work and lives. Please take a few minutes to email us to let us know how you are doing. We LOVE to hear from people (and it lets us know that people actually read these updates). If you then you have been raised with Christ, seek the things that are above, where Christ is, seated at the right hand of God. Set your minds on things that are above, not on thing that are on the earth. Cedric Moss, our pastor at Kingdom Life Church, spoke on this passage this morning. What better opportunity to remind ourselves of why we are here and doing what we are doing! This is the passage that inspired us as we began our journey into full-time ministry work, and today it is a reminder to keep our focus on things above, not on things on this earth! Before the past, the now and near future! If you haven’t done so already, consider “liking” us on Facebook! We are working on being more purposeful on updating our family ministry Facebook page frequently. We will use it to keep people who don’t check our blog up-to-date on our ministry. Of course it won’t be as detailed as this blog, but we will at least put up some highlights. 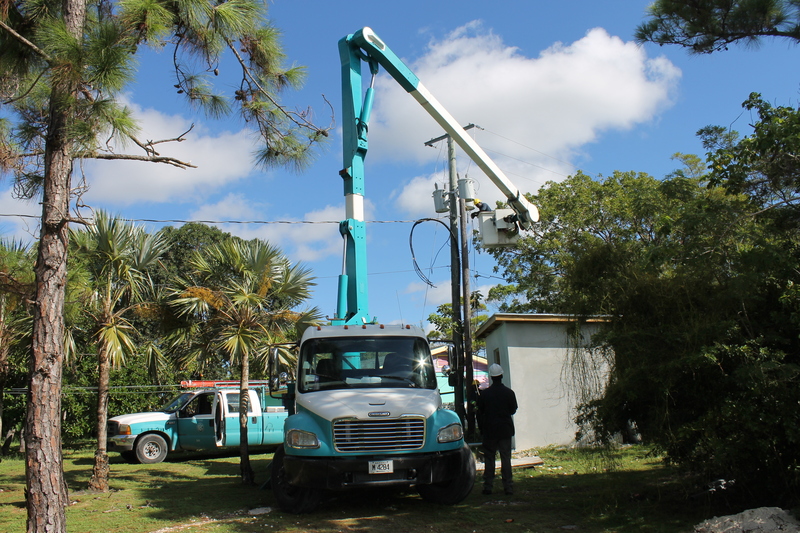 We are praying BEC (Bahamas Electric Company) shows up this coming week to finish installing wiring and a meter so we can finish the electrical upgrade here at camp. They were suppose to be here 2 weeks ago. 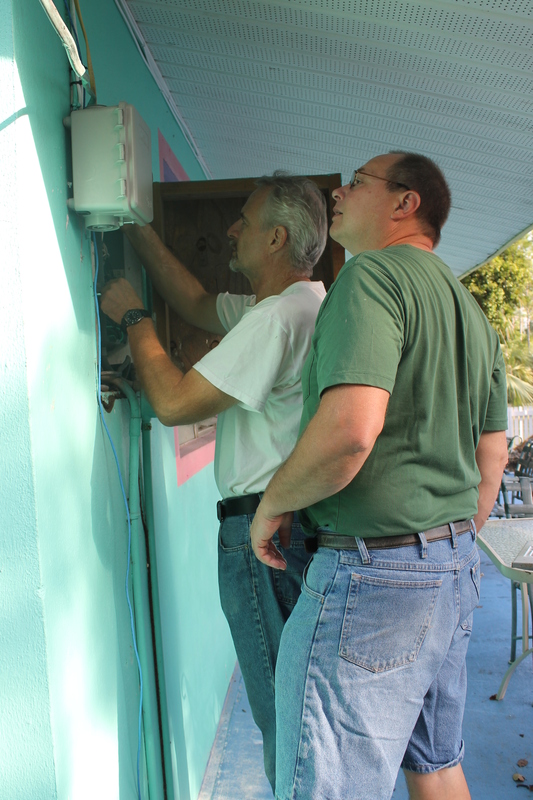 Getting this electrical upgrade done has been a long, hard process, but we have learned a lot from it. Please pray they come this week to finish the job and that everything works out well. 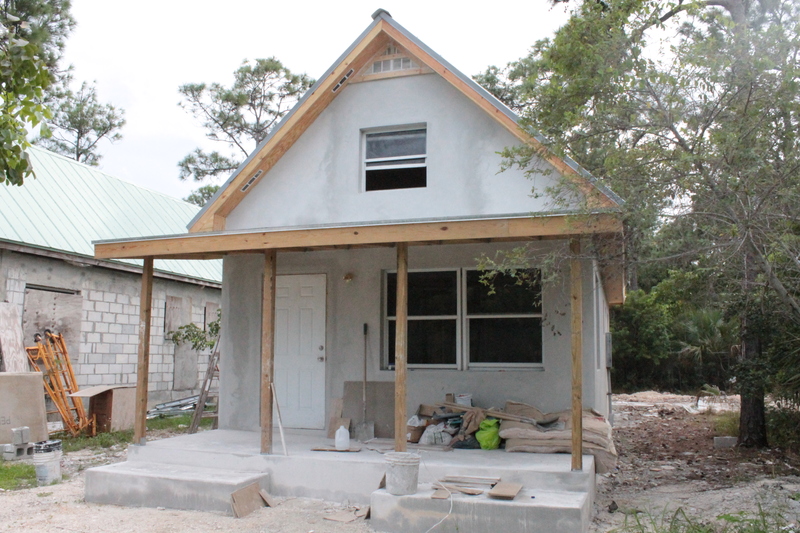 The staff cottage is getting closer to being finished (see pictures of the cottage below). It is looking really nice. 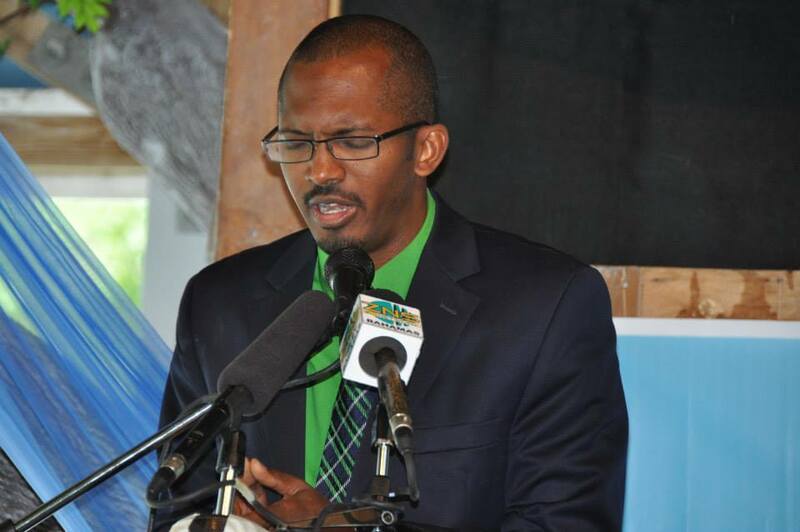 Tim is working on getting permission from the Bahamas government to have a spiral staircase shipped in duty free. The spiral staircase will be used to access the loft area of the cottage where the staff will sleep. Please pray for the timely completion of the cottage, funds to furnish it, and that the customs department will look favorably on this request for free duty. Looing inside towards the back of the cottage. Loft is the sleeping area, this is the living area, bathroom is on the right and through the door is the kitchen and dining area. Looking from the back of the cottage towards the front. 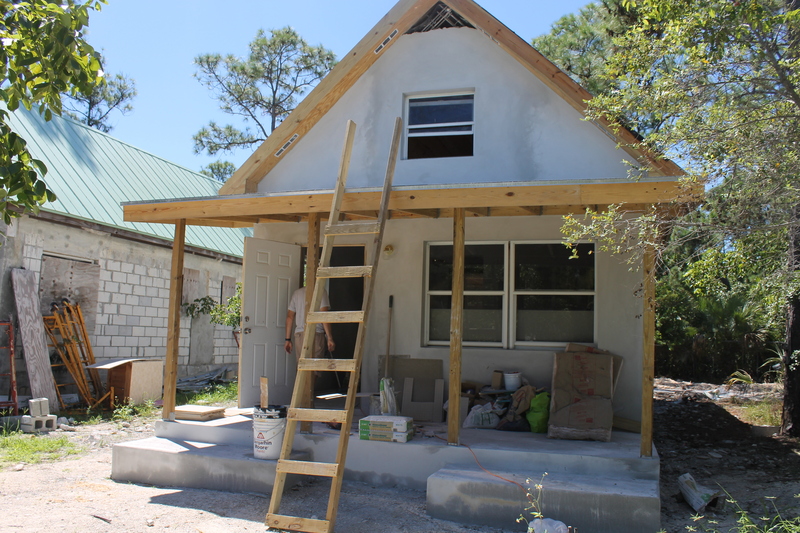 The progress of the new cottage! This is taken October 7, 2013. This weekend we will be hosting our first annual Young Adult Weekend here at the camp. The guest speaker is Jay Seegert from Creation Education Center in Milwaukee, WI. We are looking forward to having him and his wife here. Please pray for us as we work the details out for this weekend, that God sends us at least 40 young people for this event, and that God uses this weekend for His glory. The new ALC website is nearing its “go live” date. Tim and I have been working with the web developer on some of the wording and lay-out issues. It will need more work after it is activated. It is such a challenge trying to communicate via email with designers in the states. It will be a lot easier once we have control of the site ourselves. Stay tuned! We are also in the works of putting together another ALC newsletter. 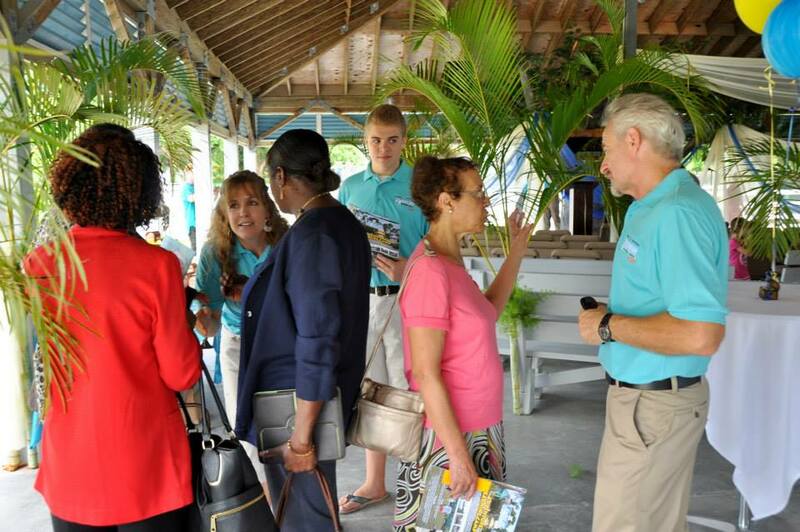 If you are not on the ALC Newsletter mailing list and would like to be, email us and let us know at tims@alcbahamas.org. Now, the past 4 weeks (minus the events from the other 2 blogs of course)! Celavie and Napela. 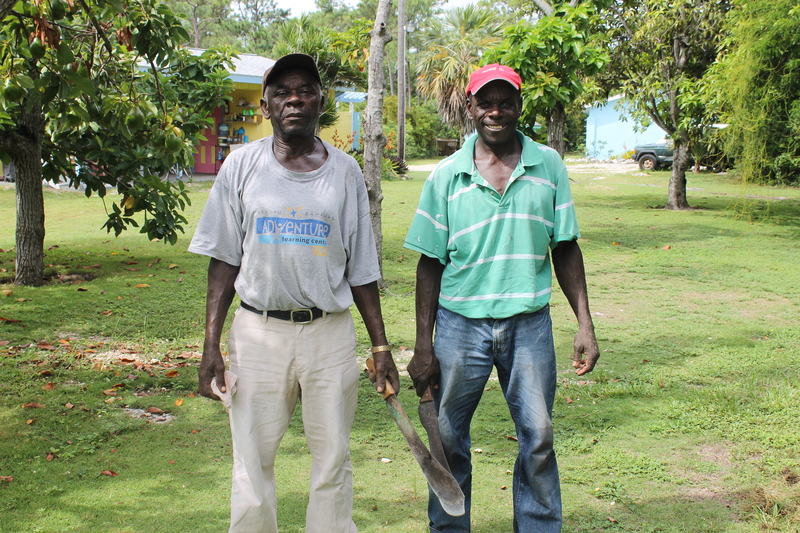 These two gentlemen are responsible for keeping the grounds of the ALCentre and the ALCamp so beautiful. They do not use edge trimmers to keep edging trimmed and weeds pulled, they use that machete. They are hard workers. Our resident IT person. Logan has fixed so many computers, worked through software issues, and helped work through technology challenges for individuals as well as for the ministry. 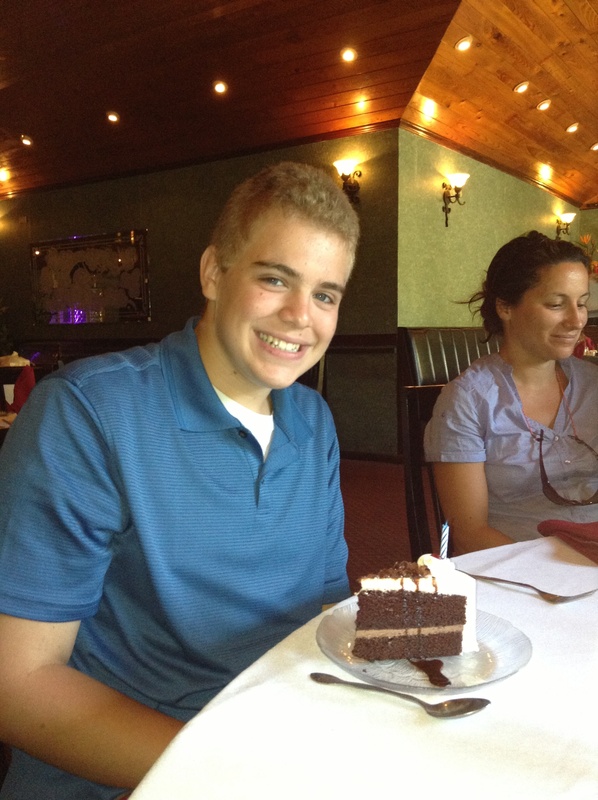 He is going to be sorely missed next year when he leaves for college. On Friday evenings, our church youth group gets together for Counter Culture. 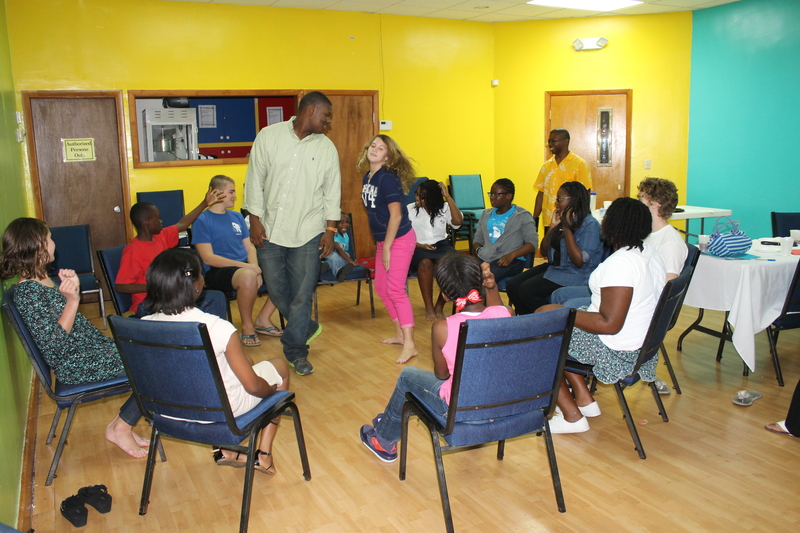 They do activities, discuss various topics and fellowship. Logan and Zachary are involved. 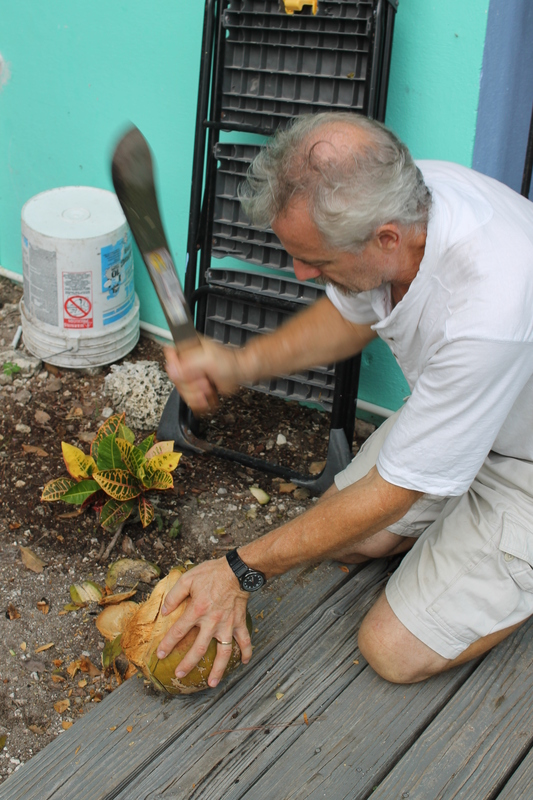 Tim using a machete to break open a coconut that had fallen from one of the trees. 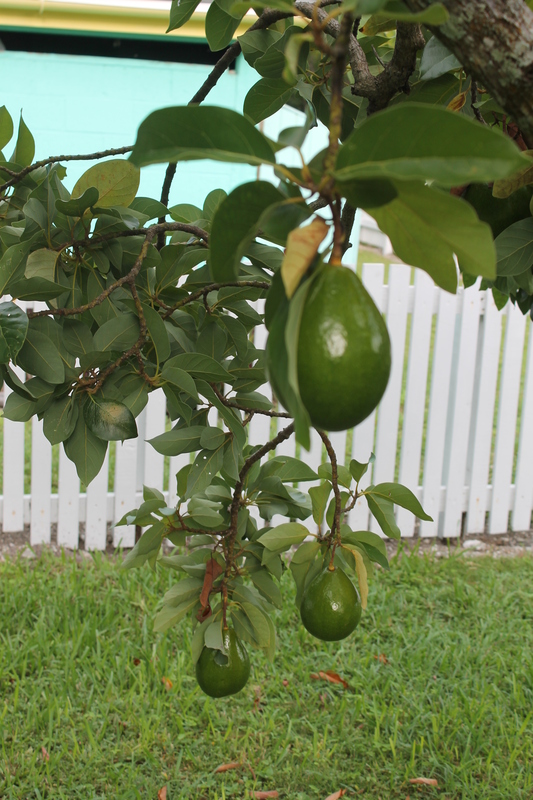 The avocados (Bahamians call them pears) on the tree just outside our back door are ripe, and boy are they delicious. We eat avocado almost every day. 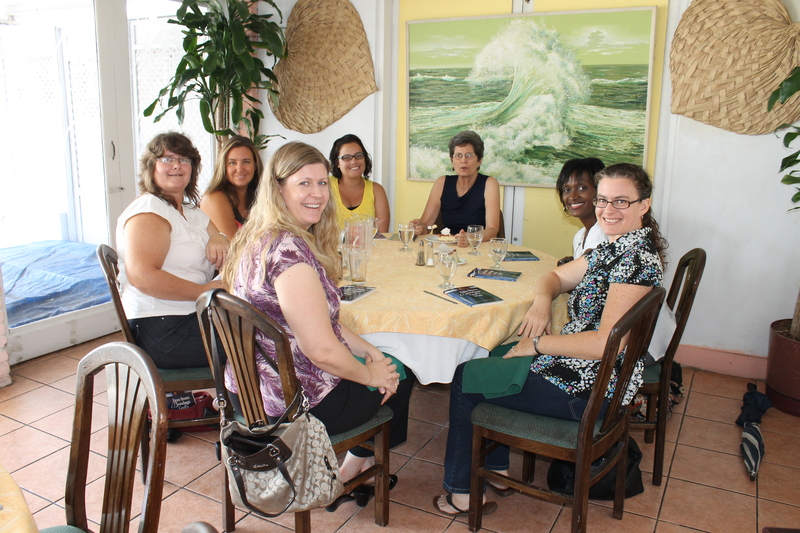 A little French culture in the Bahamas! Marion made a French dessert to share with us and we shared some our French tea with her. She felt like she was back in France. Marion is from France and has been at the ALC for the last month. She will be leaving for Haiti the first of November. She will be sorely missed, but we are hoping she will return. Mindy attends a lady’s Bible study every Thursday morning. She and the other leaders of the study had a leadership luncheon one day in mid September. 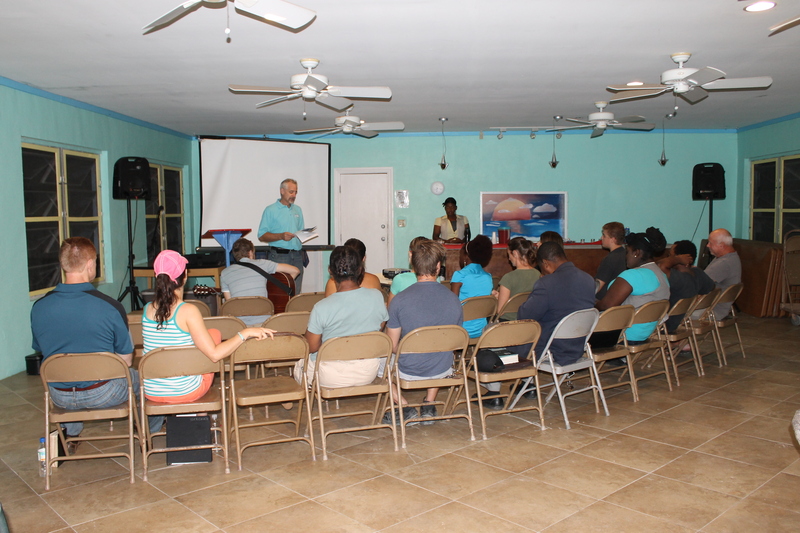 Every morning at the Centre, we join the Centre staff for devotions. This morning Jen Rogers was in charge of the devotion. We are going through the book of Galatians. Had us do an activity to remind us of who we are in Christ. Tim and his cousin Jon Stassel trying to figure out why our house keeps blowing fuses. Right now we are unable to turn on our light and fan in our bedroom because it keeps tripping the breaker. During the 20th Celebration, Annika Grebe was here. We snapped this picture because when we saw her sitting on our couch, it reminded us of this past summer when she was here for a couple of weeks. We have another picture of her in an earlier post in that same position. 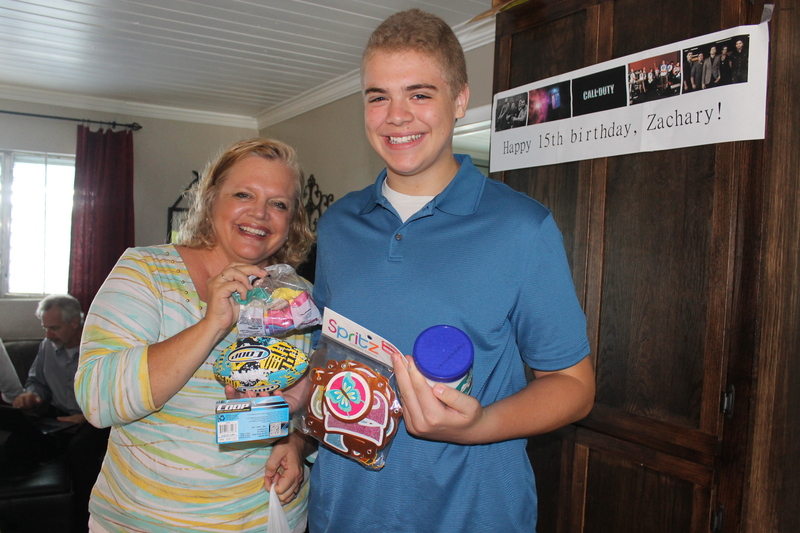 Mom felt bad that Zachary had been “forgotten”, but at least there were a lot of people still around from the 20th Celebration to help him celebrate. 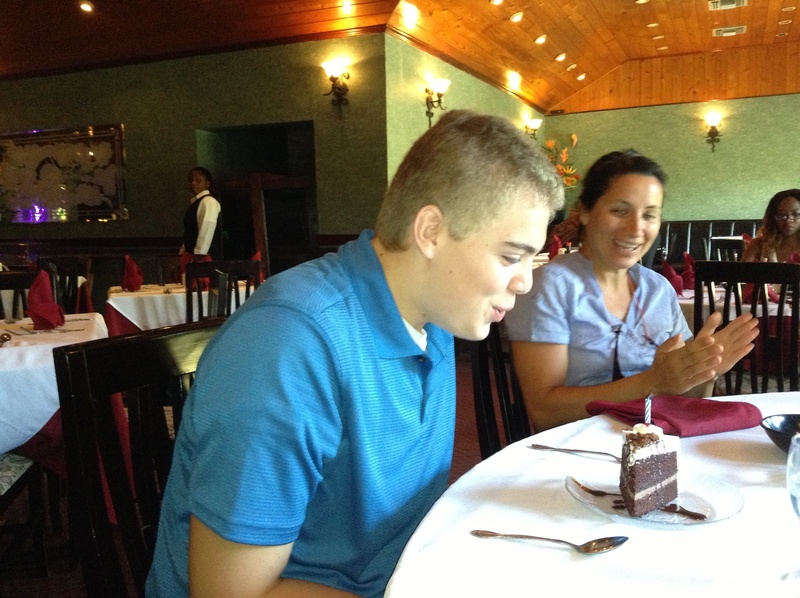 We went out to a Chinese restaurant for lunch, and thanks to Roger and Grace Grebe who insisted we have dessert, Zachary had a birthday cake with a candle even. 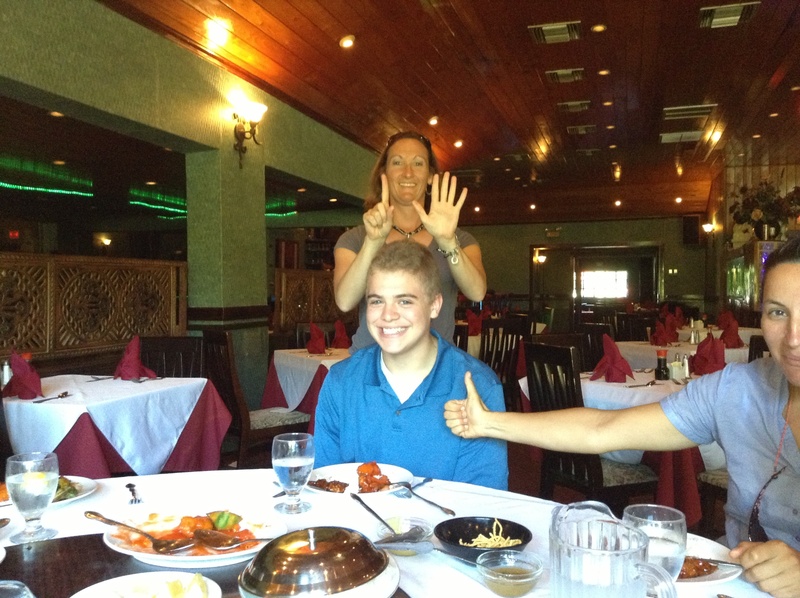 Notice the 1 and 5 above his head. Thanks Jen! One tradition we didn’t lose: the annual picture with mom and dad. This year he is a head taller than mom. 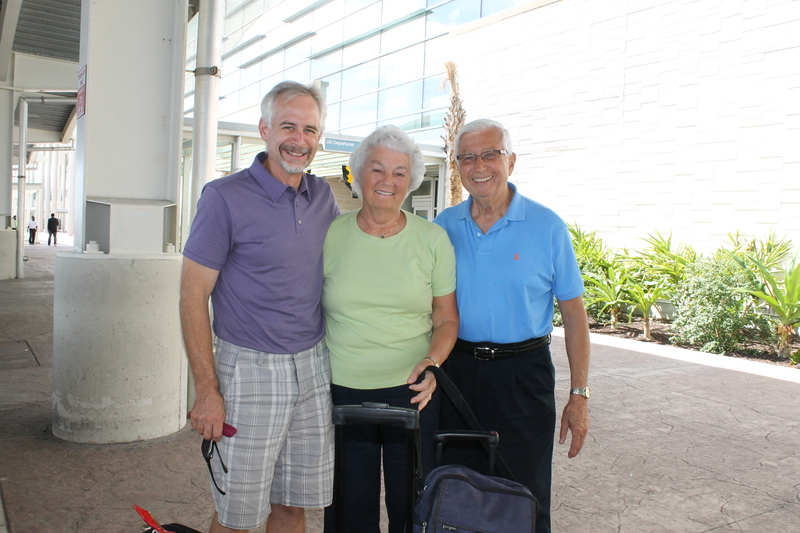 On Monday, September 23rd, we took Roger and Grace Grebe to the airport. 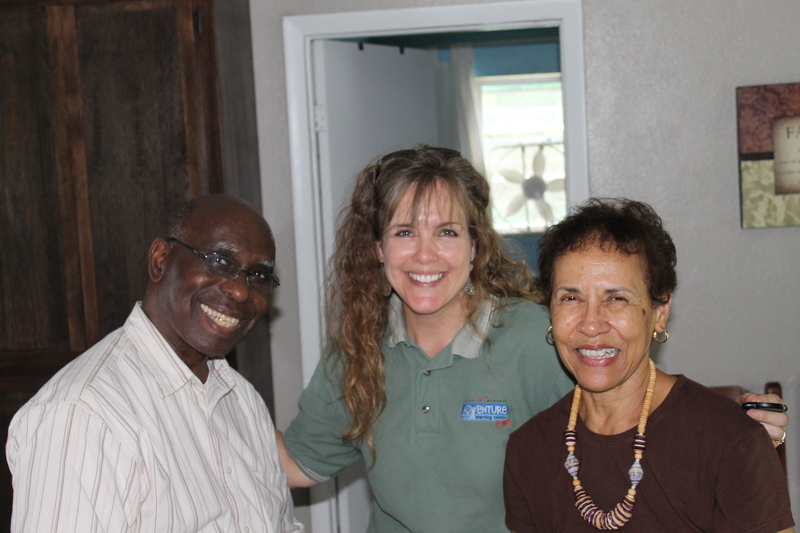 We had lunch with Alfred and Maria Nakhla before dropping them back off at their hotel. They left the island on Tuesday morning, September 24th. 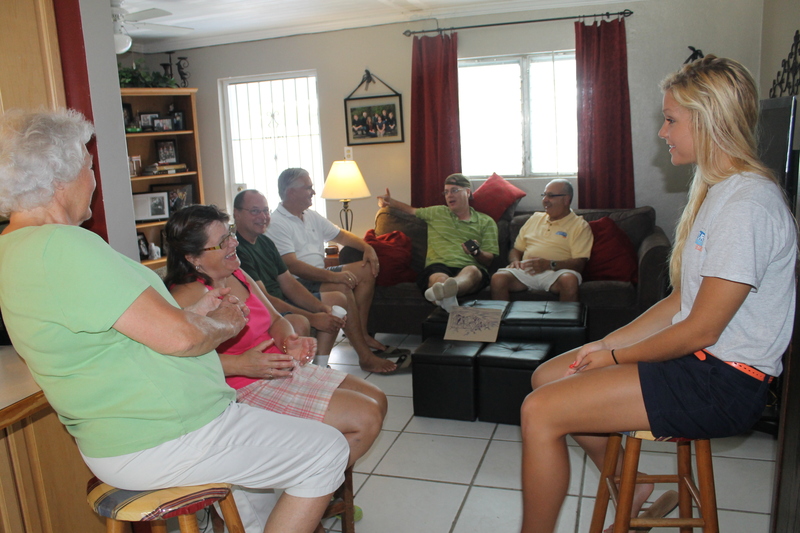 We enjoyed the visit with them. On Monday afternoon, Mindy took Marion downtown. She had never been downtown Nassau. After a little shopping, they went to Cabbage Beach. It was stormy, but that did not stop adventuresome Marion. 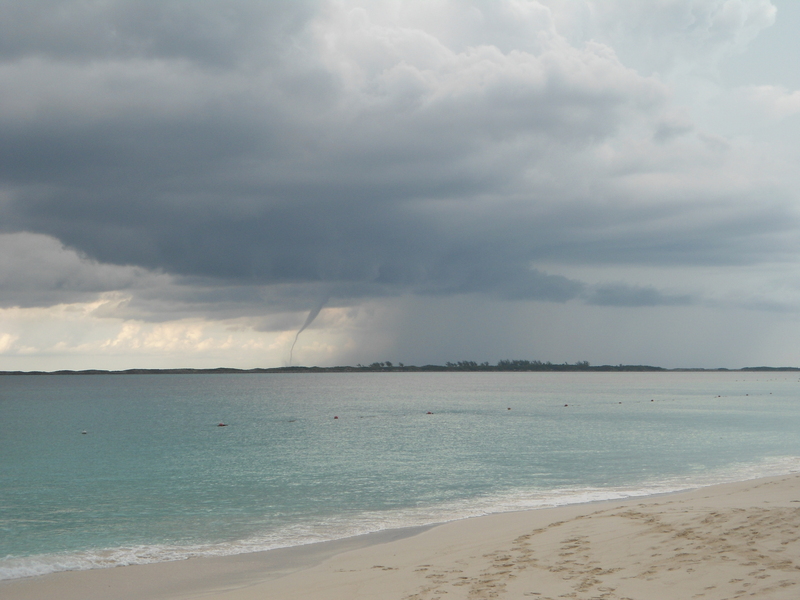 If you look closely, there was a water spout (a tornado over water) just to the north of Paradise Island here. A better picture of the water spout. 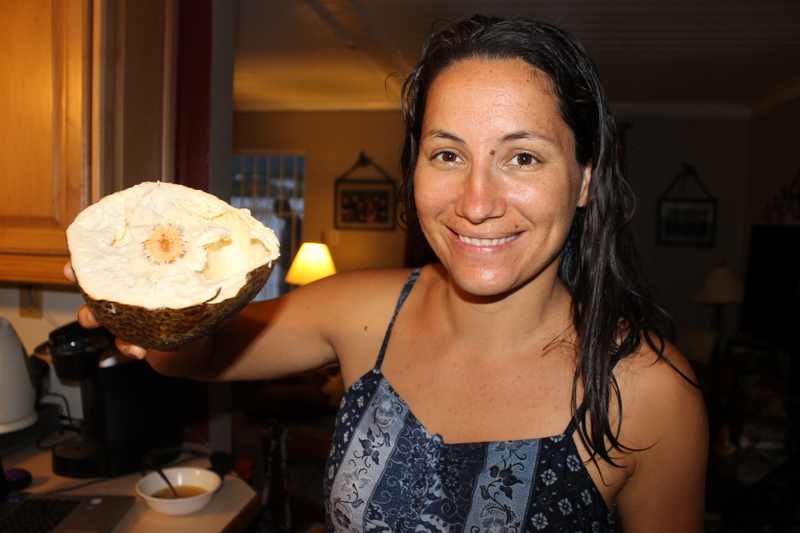 This is a bread fruit. We are still not sure what you are suppose to do with it. We read somewhere that you are suppose to make like a milkshake with it. It has an “interesting” flavor. Monday evening we went out to dinner with Jon and Annemieke for their last evening on the island. Tim’s cousin Jon and Annemieke, the first to arrive at camp for the celebration and the last to leave the camp. We enjoyed the extra time with them, and because they lived here for six years in the 1990’s, they enjoyed visiting old friends and places. First day of programs at the Centre. 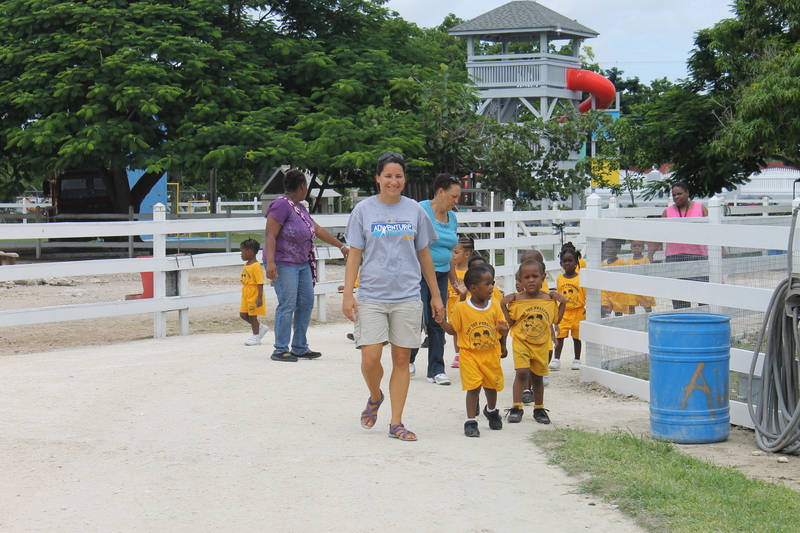 The first week (Sept 24-27) was mostly preschool aged children. Marion helping during her first day of programming. 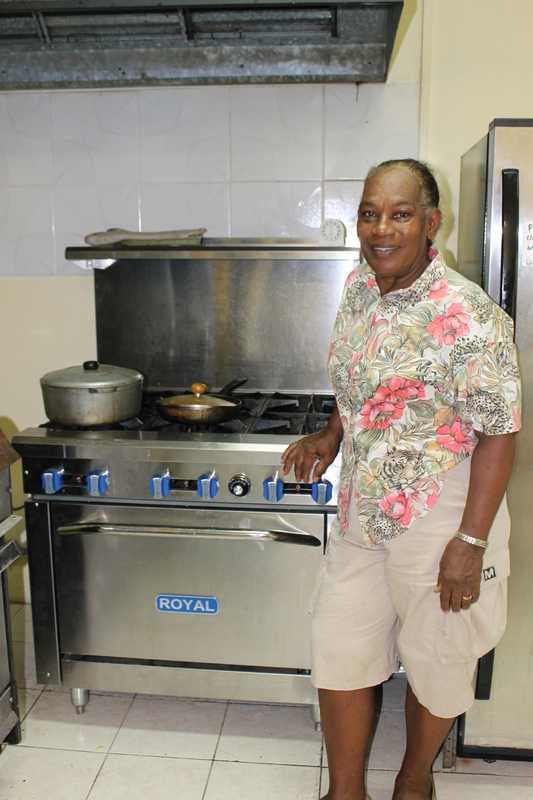 Miss Aida, our lunch lady! Our four facilitators! They teach and they wait tables. They are so busy and are such hard workers. From left to right is Tika Penn, Jen Rogers, Sam Robb, and Marion Brodeau. Way to go ladies! Friday lunch at the beach and “PE class” for Zachary. One of the benefits of living on a small tropical island. 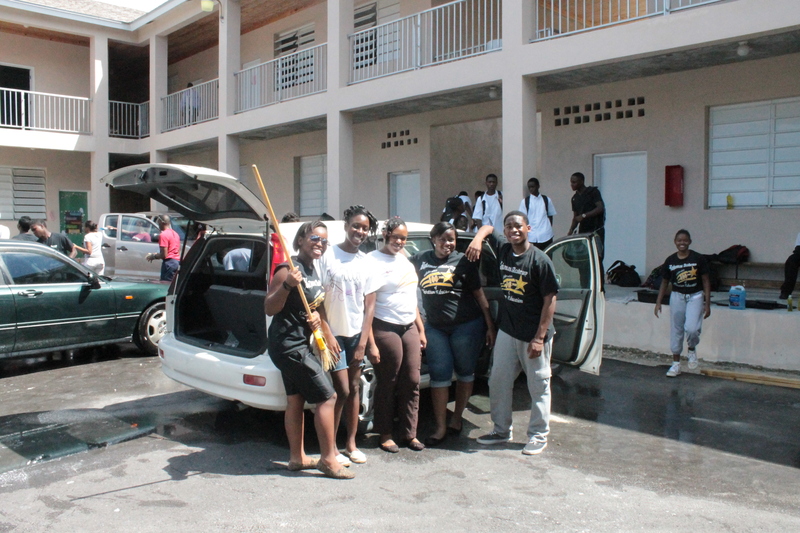 The Seventh Day Adventist school next door to the Centre was having a car wash fund raiser. We paid them only $10 to wash the car inside and out. They did a fantastic job. Counter Culture at the Bunting’s house. 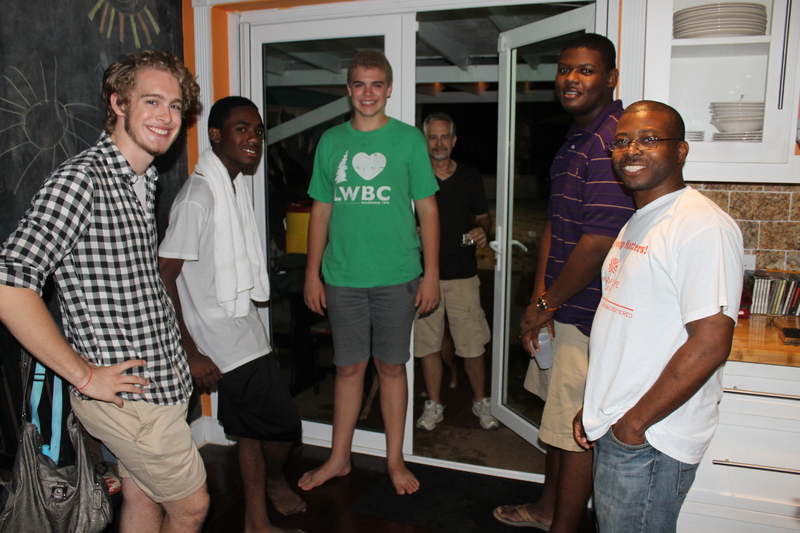 Some of the guys in the youth group with Clarence, the leader of Counter Culture. This nights discussion was on music. Led by our very own music pastor, Keith Bunting. 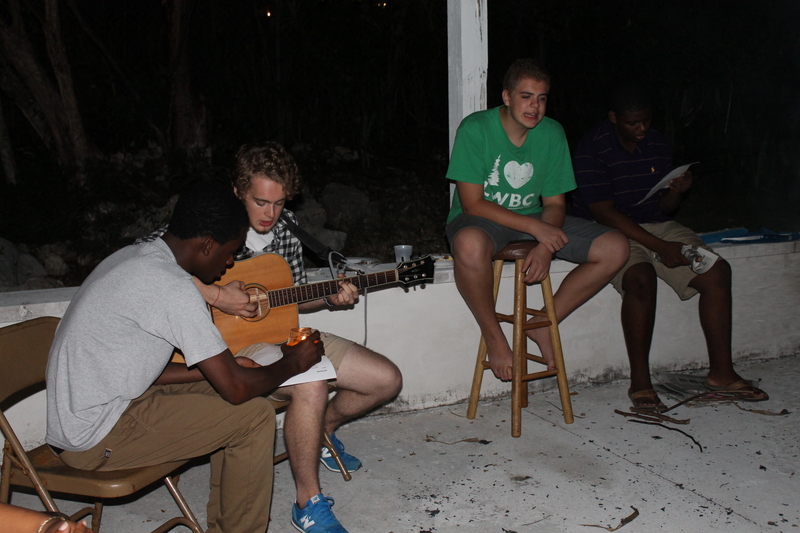 Logan helped lead worship around the pool. Marion cooked all of us a French meal. The fellowship was great! 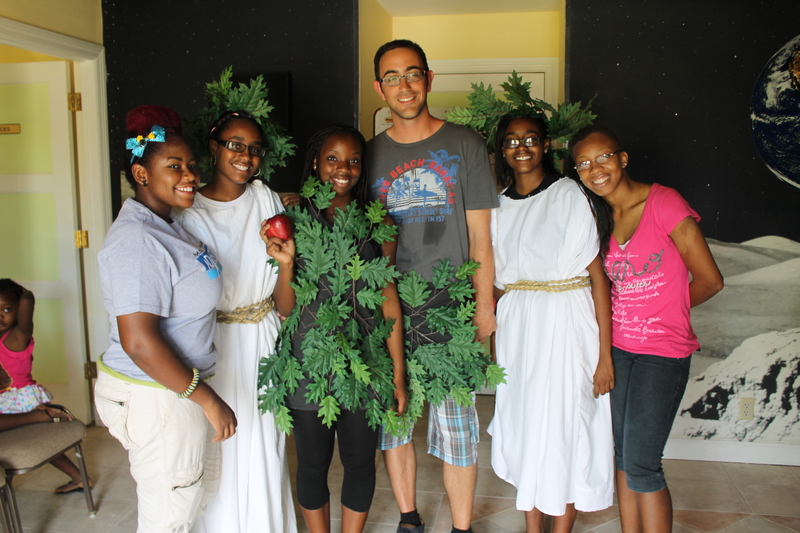 Earlier this past week we began following up on groups about the young adult weekend coming up next weekend at camp. This is Renee Saunders. Her husband is a pastor of a Baptist church. We met Renee earlier in the year when her group stayed at the camp. Tuesday evening we had the Buntings over for dinner and a time of fellowship. Marion and Jen joined us for dinner as well. 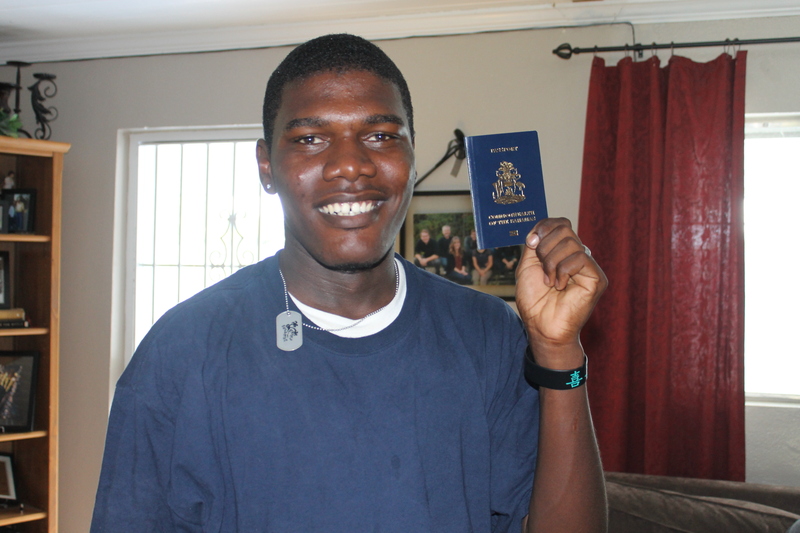 Kevin stopped by to show off his passport. He finally got it. Tom had been working on getting this with him since we arrived in January. He is so proud of finally having a passport. Now he can leave the Bahamas. This couple, Sydney and Yvonne Bootle, attend Christ Community Church. They met when they attended Joy Bible Camp (now Adventure Learning Camp) as young people. We had lunch with them last week. What a joy it was to meet these people and hear their story. 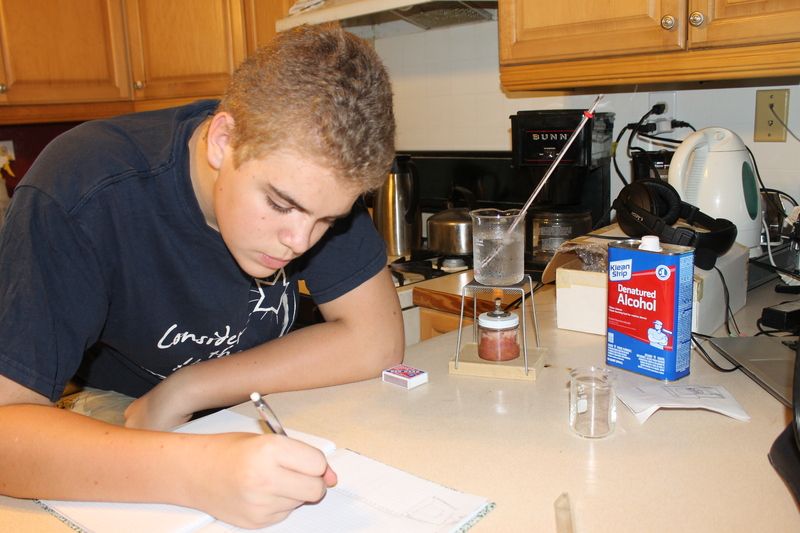 Zachary working on a Chemistry Lab assignment. It took forever to find that denatured alcohol on this island. 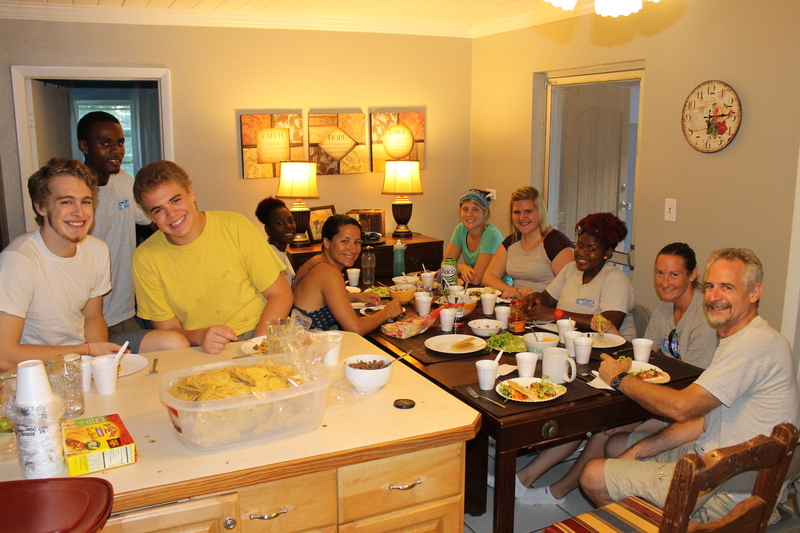 On Sundays, College of Bahamas students that attend our church are invited to eat lunch in various church member’s homes. 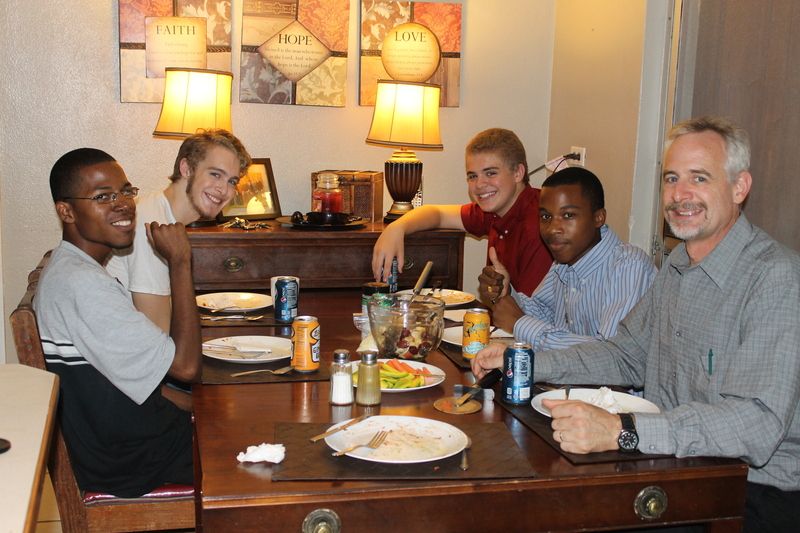 This weekend we got the privilege of having 2 of the young people at our table with us. 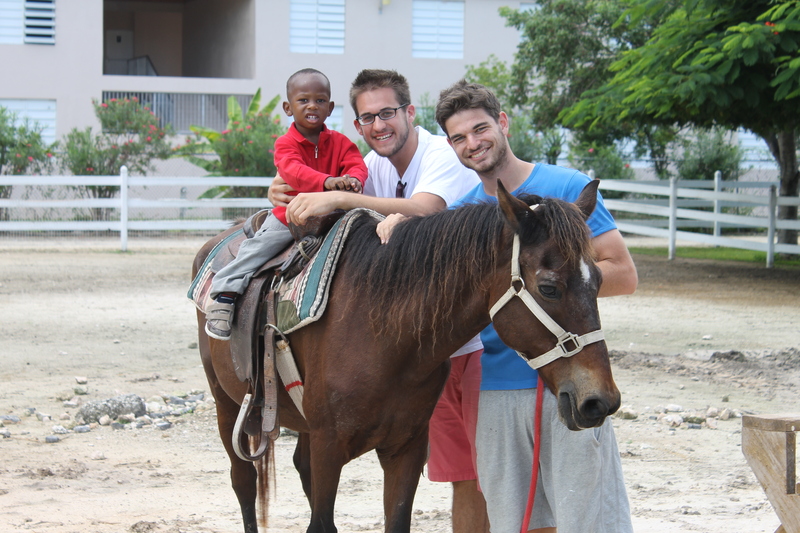 This is Richard (next to Logan) and Jahlil (next to Zachary). 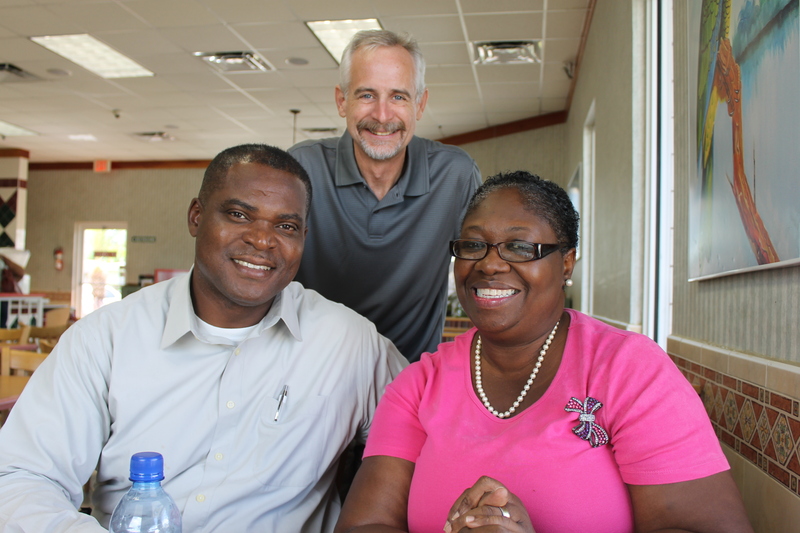 RIchard is from Grand Bahama and Jahlil is from Andros/and the USA/ and Martinique (he is a US, France and Bahamas citizen). Marion was enjoying speaking in French with Jahlil. Jahlil’s mom, being from Martinique, taught her sons French, and Jahlil knows French. 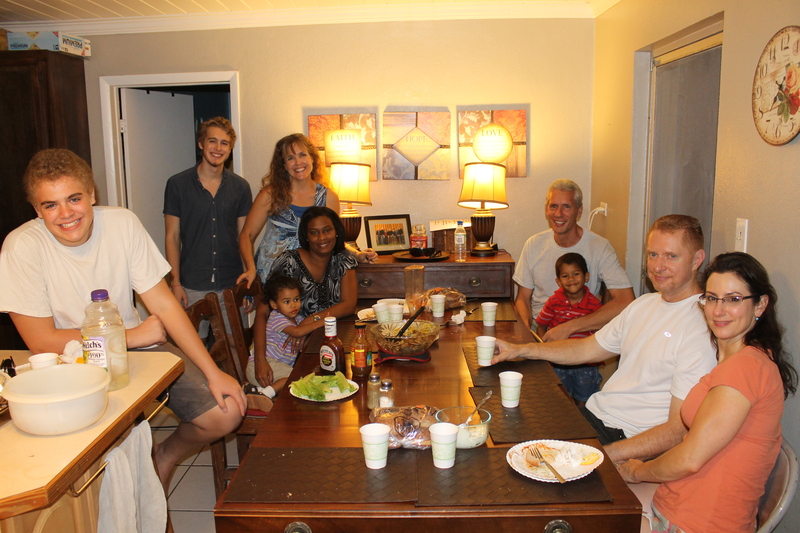 One of the blessings of being a foreign missionary in a developed country: not only hearing but seeing our adult children who are so far away! Rest assured we do not take this huge blessing for granted. What an encouragement it is to be able to see our grown children! 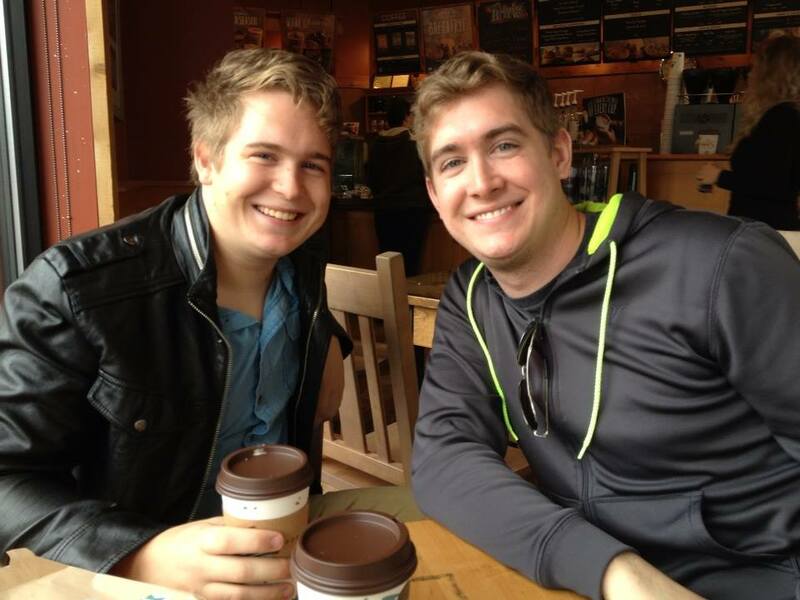 Another way we get to see our boys who live in Minnesota: pictures taken by our daughter in law who also sees the value in photographing moments and posting them on facebook. Whew! You made it through three very long catch-up posts. Have a great week! Prayer requests can be found on the other 2 posts. 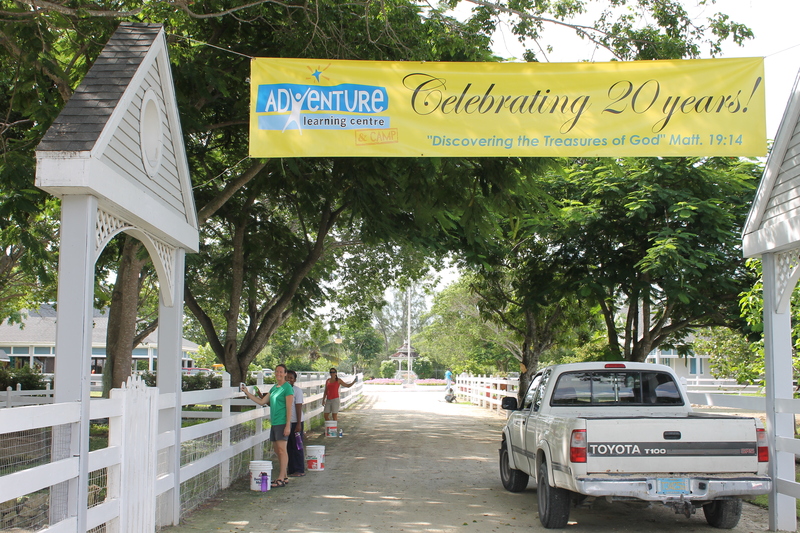 Celebrating 20 Years of Adventure! 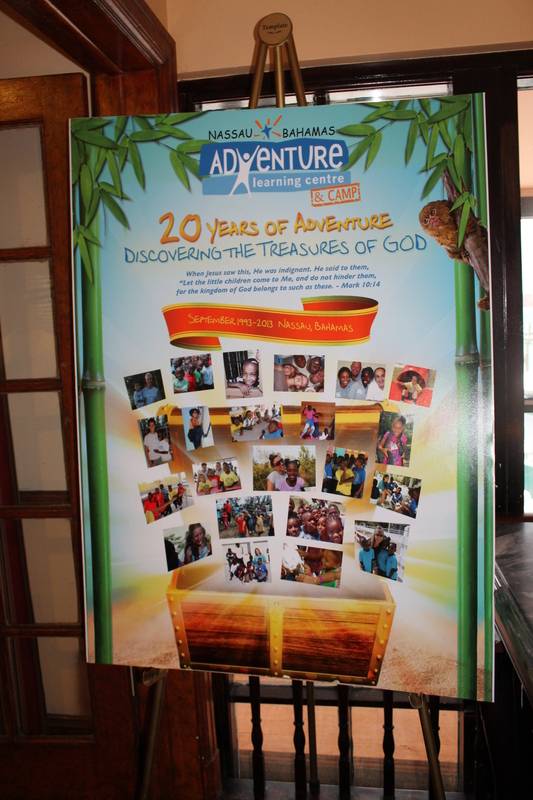 October 3, 2013 7:11 am / 1 Comment on Celebrating 20 Years of Adventure! 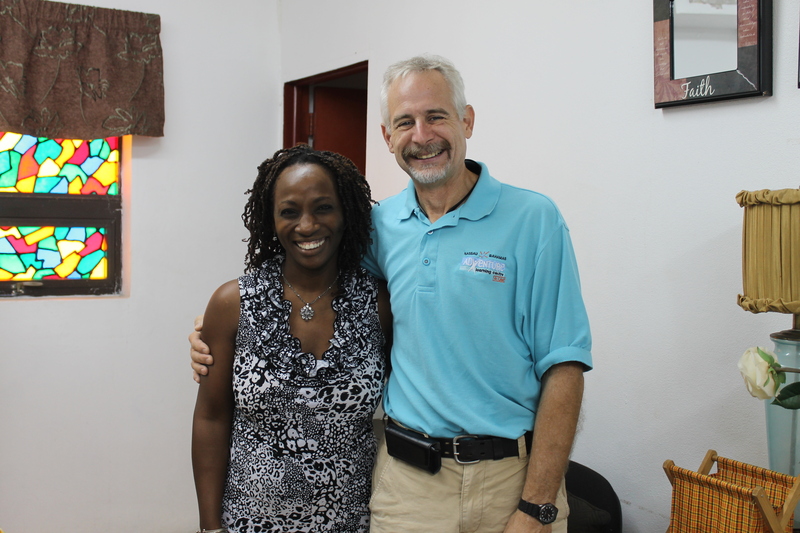 Randy and Kim Grebe in the early days of Adventure Learning Centre. Taken from the tower at the Centre. Where there is no vision the people will perish. 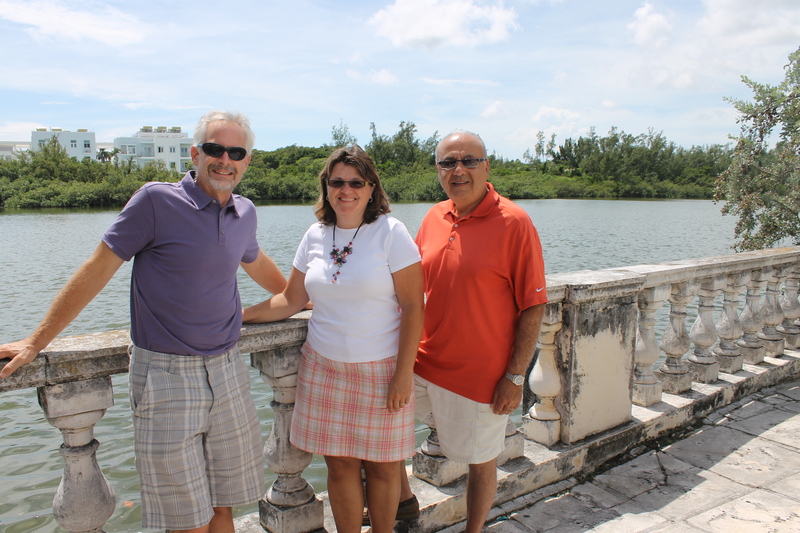 The adventure began in 1986, when missionaries Randy-affectionately known as “Uncle Randy” to the Bahamian students-and Kimberly Grebe had a vision for reaching out to students in the Bahamas. 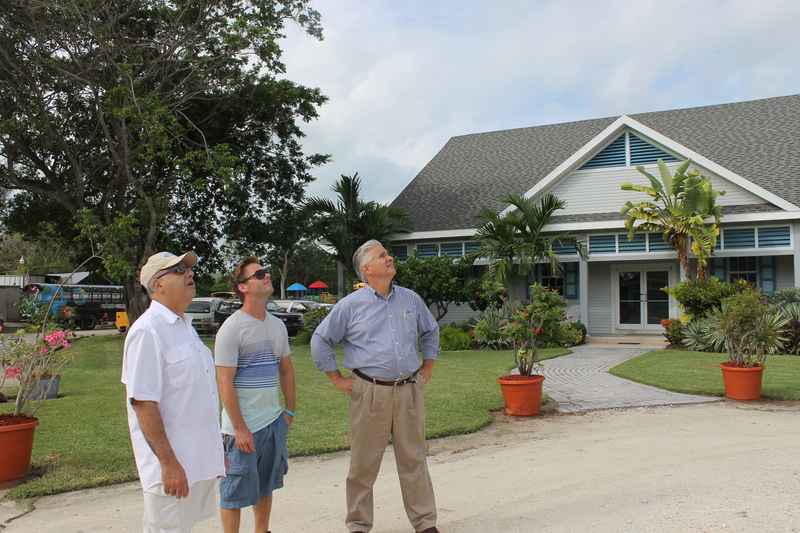 The Grebes envisioned an outdoor education centre that used the visible wonders of God’s creation to minister to students of the Bahamas. 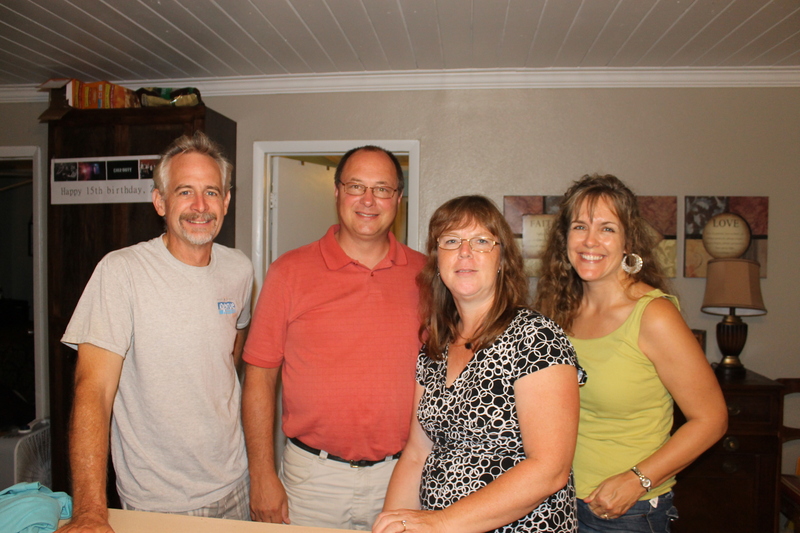 At first, Randy and Kim took their hands-on programs to the schools and youth group outreaches. 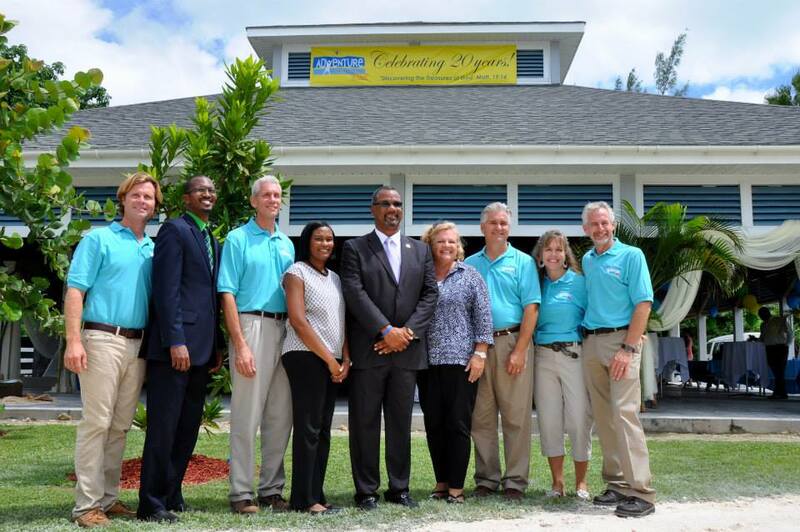 In January 1991, after presentation and approval of the proposed programs and building plans to the Bahamian officials and Ministry of Education and a generous government approved land offer by Hesketh and Dawn Johnson of Crossroads Ministry, the ground breaking and construction of Adventure Learning Centre began at the site where the main section of the Centre is today. Psalm 127:1, “Unless the Lord builds the house, its builders labor in vain” was the guiding scripture during the building process. 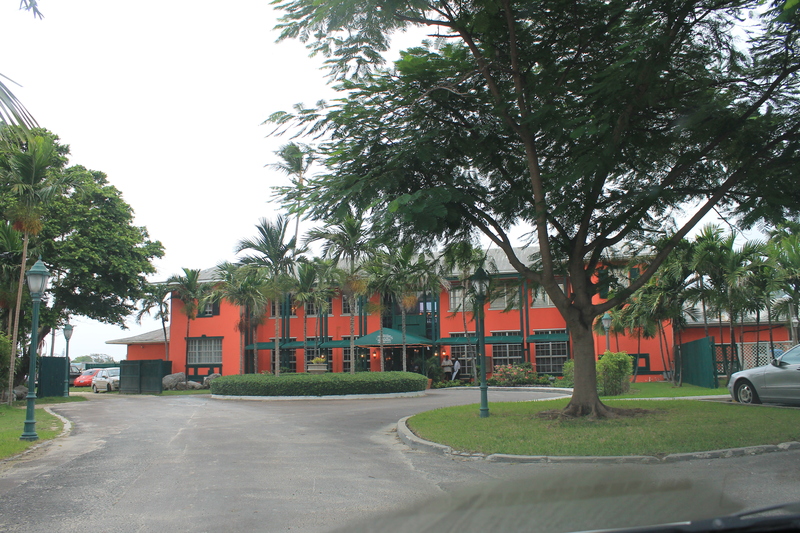 The Centre was built by the financial donations and volunteer labor from generous supporters throughout the world. 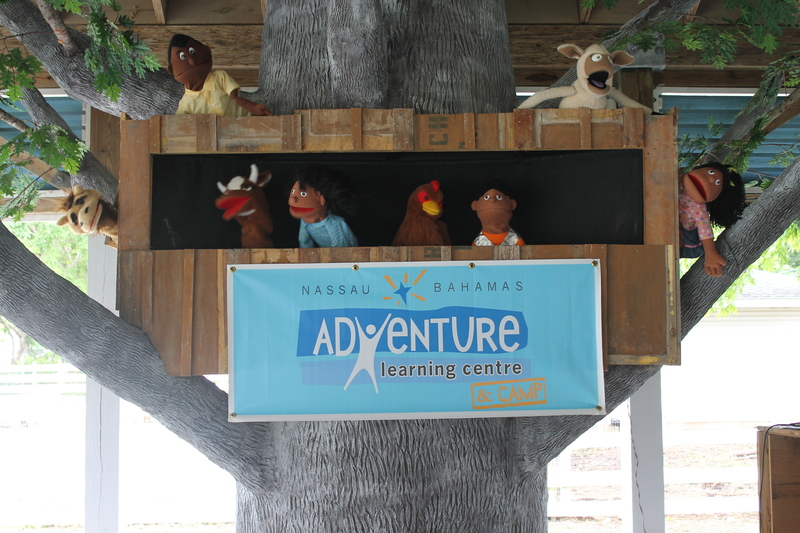 On September 13, 1993, with the official endorsement of the Ministry of Education and a grand opening ceremony, Adventure Learning Centre began reaching thousands of children through field trips to the island’s only outdoor education program. The first group of students arrived on October 18, 1993, and by the end of the first school year, 7,700 students had visited the Centre. 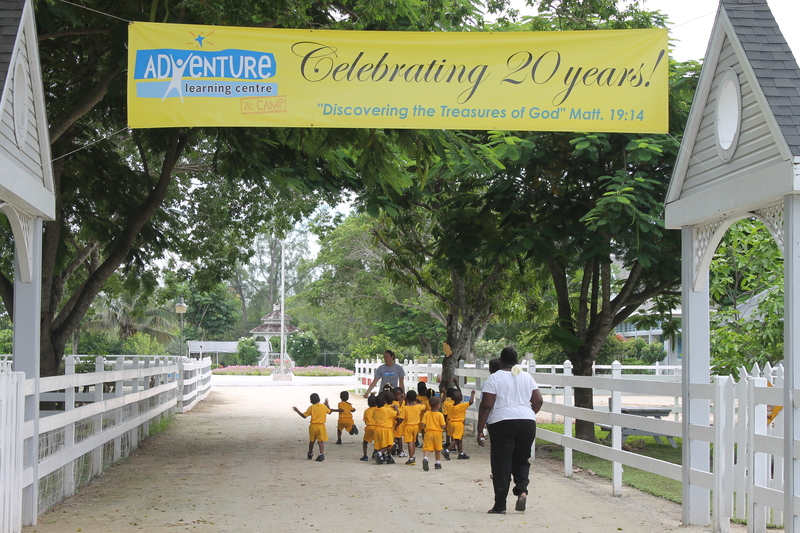 Formerly Joy Bible Camp, Adventure Learning Camp was offered by Canadian missionaries Jack and Audrey Adams in late 1993 to Adventure Learning Centre board of directors. 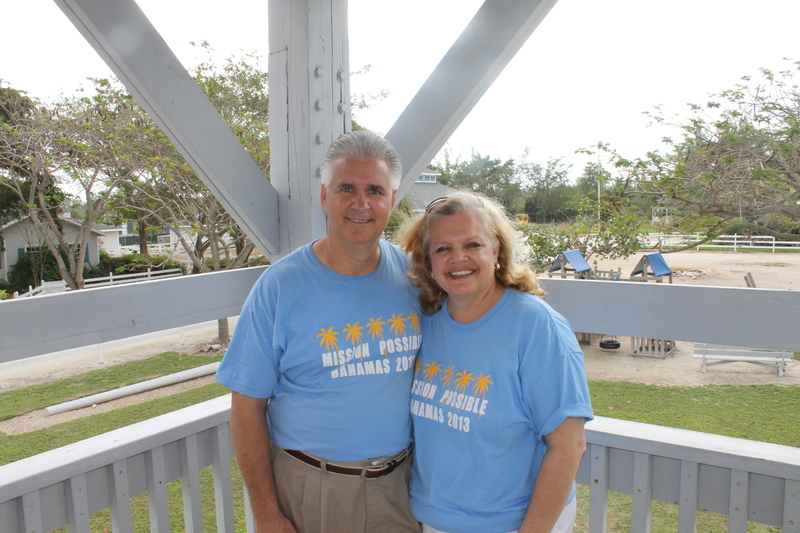 Randy and Kim Grebe on the tower in February of this year when they were on the island chaperoning a mission team from the school in Florence, SC where their daughter attends school. 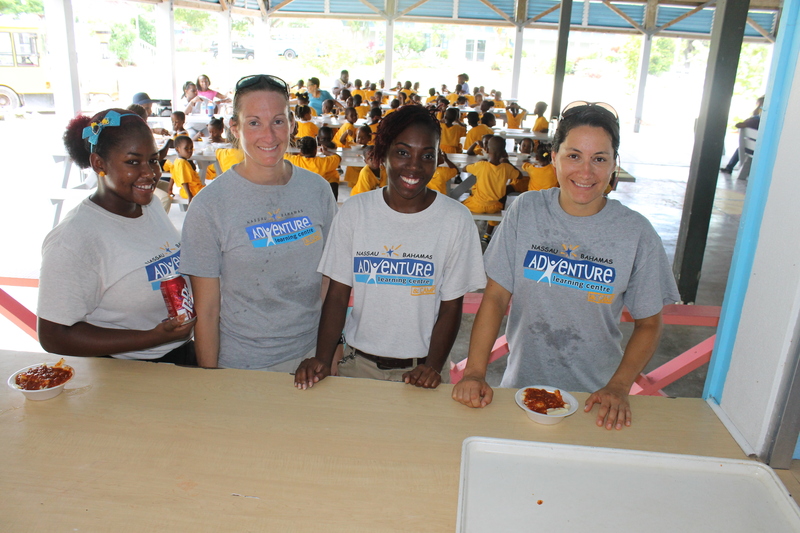 On September 19-21, 2013, Bahamian dignitaries, past and present staff, volunteers and board members, and friends of Adventure Learning Centre and Camp gathered to celebrate 20 years of “Bringing the Wonders of God’s Creation Together with the Curiosity of Kids” and “Exposing Laborers to the Harvest Through Short-term Missions” at Adventure Learning Centre and Camp. 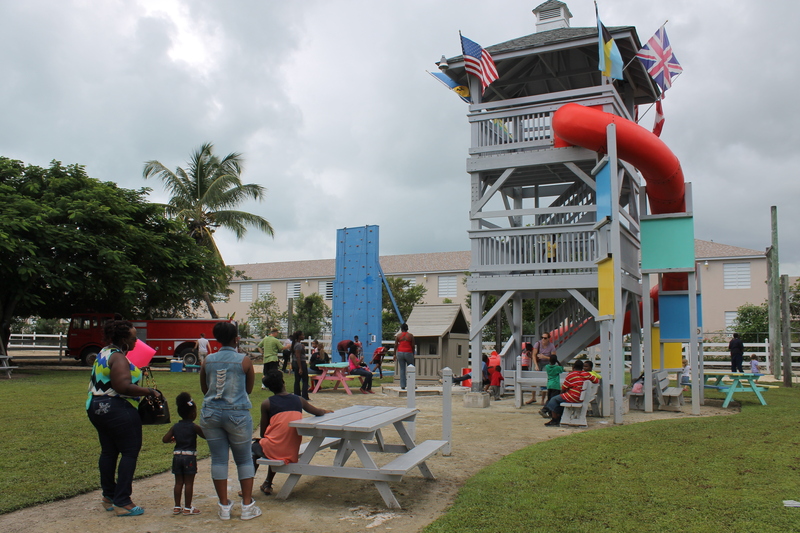 The three days of events included a donor dinner at a Nassau restaurant on Thursday evening, a celebration ceremony at the Centre on Friday, and a Family Funday on Saturday. It was a wonderful time of celebration remembering and reminiscing about the past , thanking God for what He is allowing us to do now, and praying for wisdom as we look ahead to the future. We now invite you to enjoy pictures from the days leading up to the big events and the big events themselves! Preparation for the 20th Celebration at the Centre began last Spring with meetings for making the picture book and planning the 3 days of events. During the 2 weeks leading up to the Celebration, work on the program and facility took much of our time. 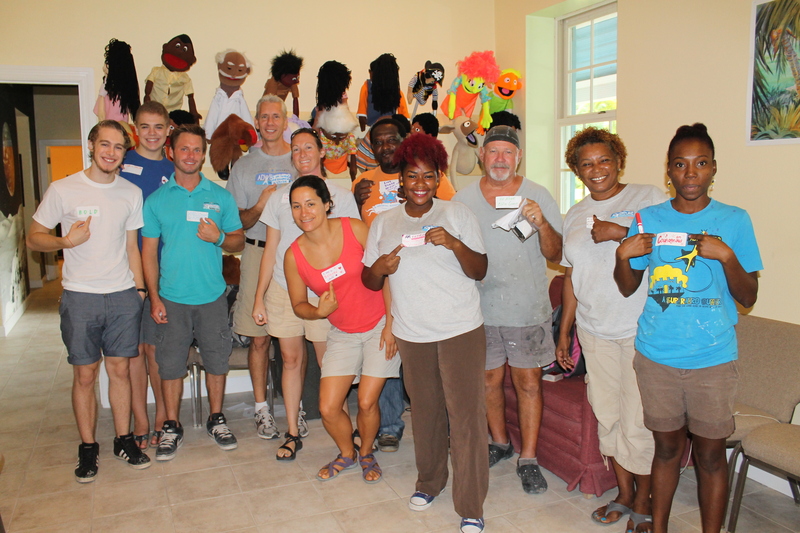 Here the facilitators were working on the puppet show in the new puppet stage. The puppets in action in the new puppet stage tree house. While we did help with some of the preparation activities at the Centre, we also prepared for and hosted 14 people who had come from the States to attend the Celebration. This is Jon and Annemieke Stassel. They were the first of the out of town guests to arrive. Jon is Tim’s cousin and was a huge part of the construction of the ALC. They ministered at the ALC until 1996. 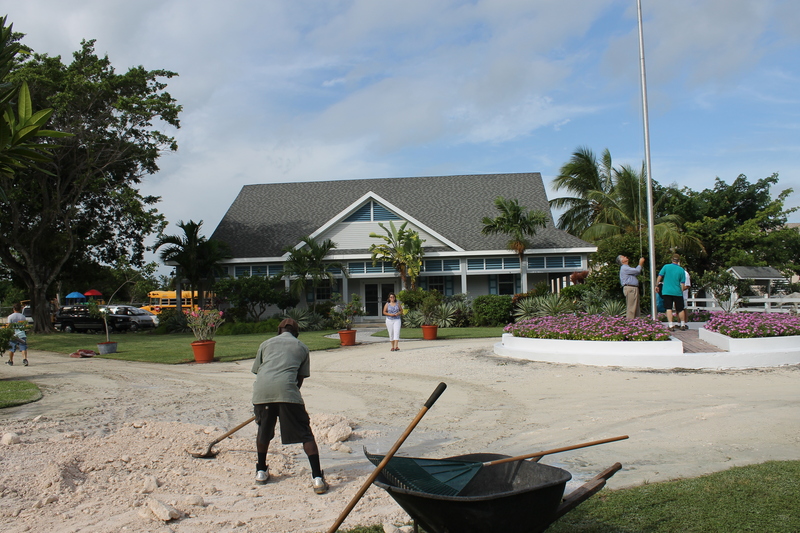 Another of the big projects was the cleaning and repairing of the structures around the Centre. On Thursday, September 19th, Tika, Sam, Marion and Jen continued the HUGE job of scrubbing fences with bleach. 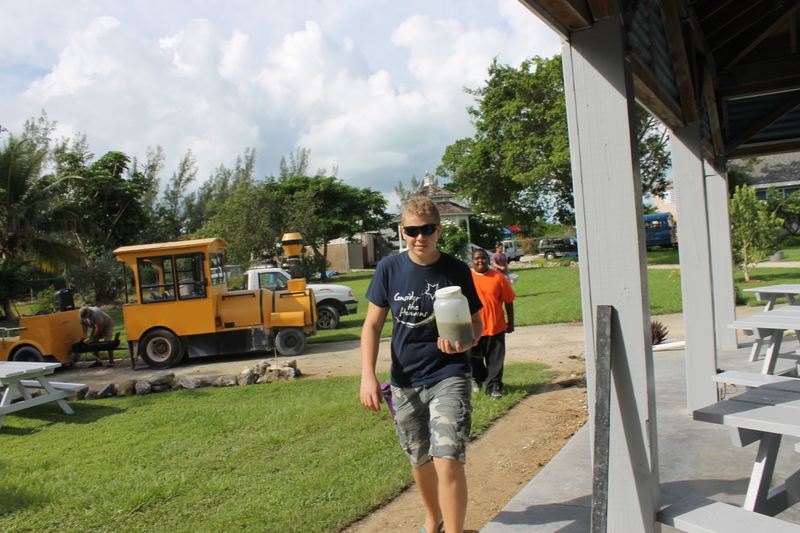 Zachary and RJ (Centre Office Manager, Eldora Knowles’ son) were also recruited to help get the Centre ready for the Celebration events. RJ and Zachary painting the wall around the flag pole. 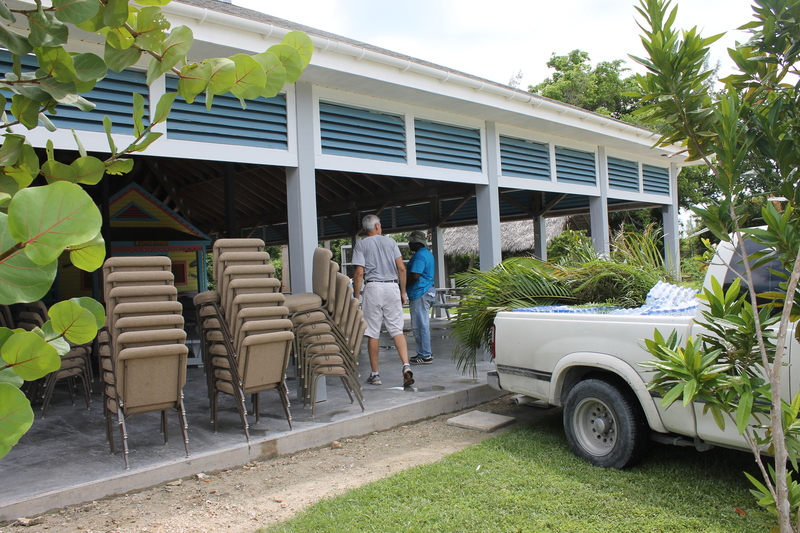 Moving chairs from the Media Centre to the pavilion for Friday’s ceremony. 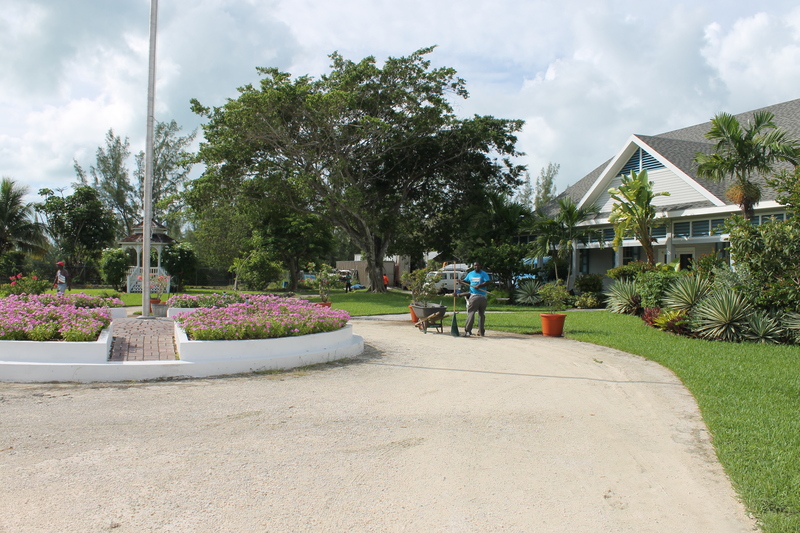 Tom Schafer (our maintenance guy), Sean Wilson and our other 2 grounds keepers worked really hard around the Centre as well. One of my (Mindy) jobs was to make airport runs to pick up guests. This is Humprhey and Marilyn Duncanson. They are from Long Island, New York and were on the ALC board during its early days. It was great meeting and hosting these dear people. 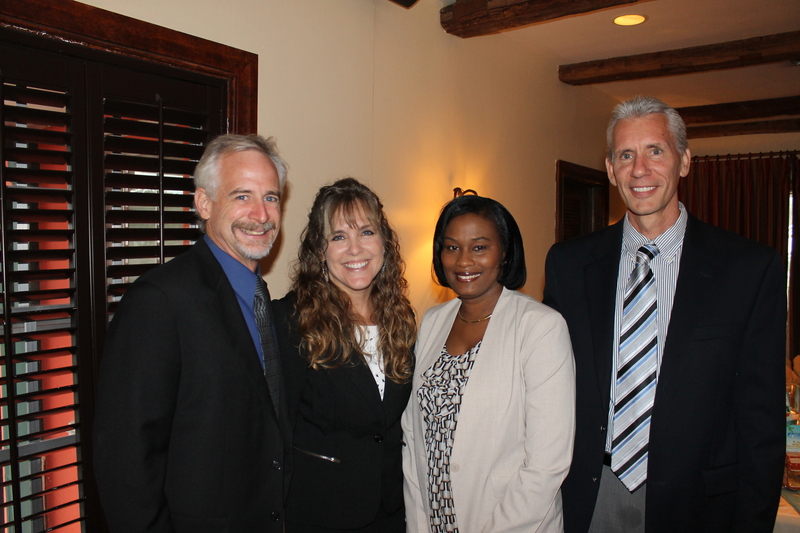 Thursday evening’s donor reception took place at Luccianos in downtown Nassau. 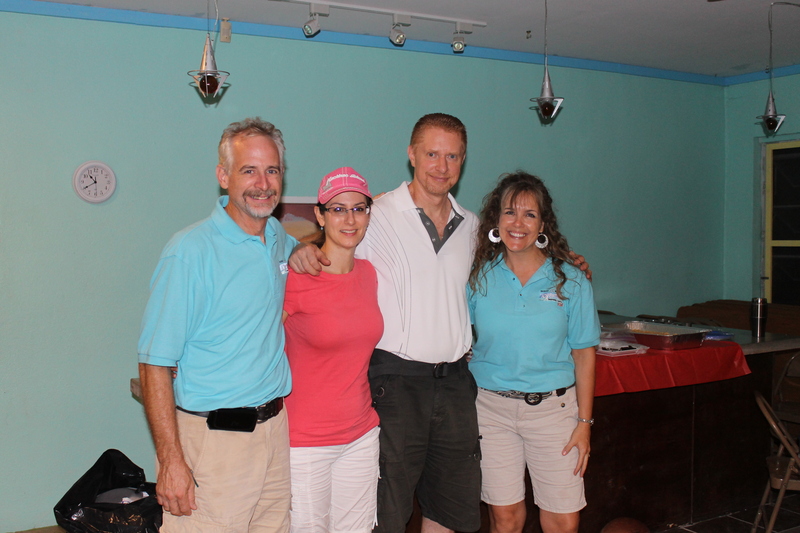 Mark’s wife, Kim, did a fantastic job at decorating and putting together the decorations for the events. She and Mark spent 100’s of hours working on the details of the events. Our table at the donor reception. 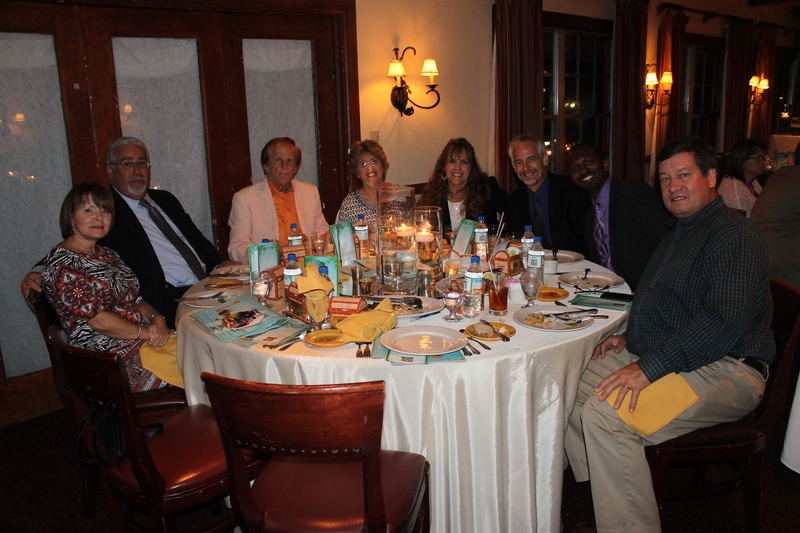 Seated with us are Cranston Knowles (current board member), Mark Davis (past board member), as well as 2 couples we had just met that evening. Mark Wallace, Randy Grebe, Tim, Lee Burtelson (current board member), and Minister of Education Jerome Fitzgerald spoke at the reception. 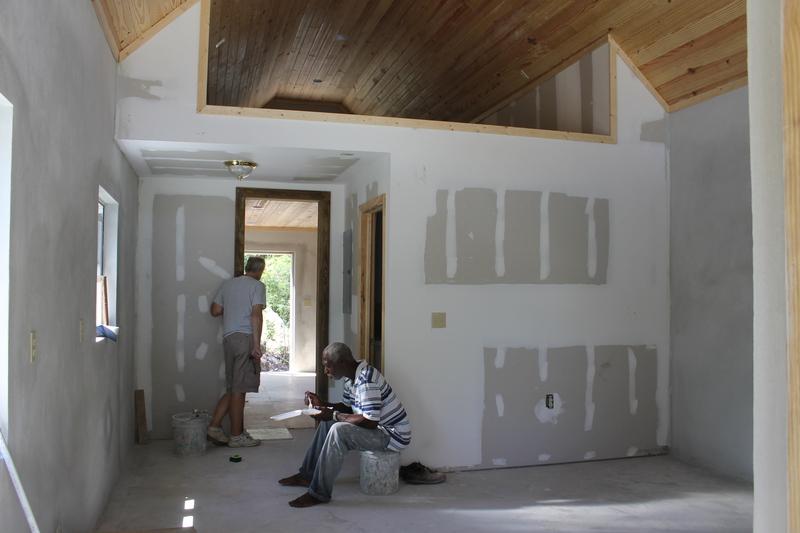 Friday morning, after a time of prayer with the staff, we began putting the finishing touches on the Centre. It had rained heavily on Thursday evening and a little on Friday morning. Dirt had to be brought in to absorb some of the water. 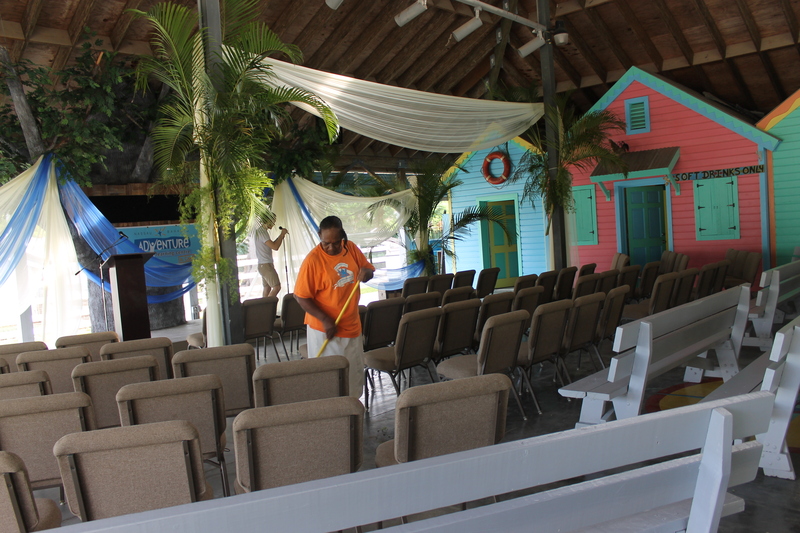 Ms. Aida one of the many helpers getting the pavilion ready for the ceremony. 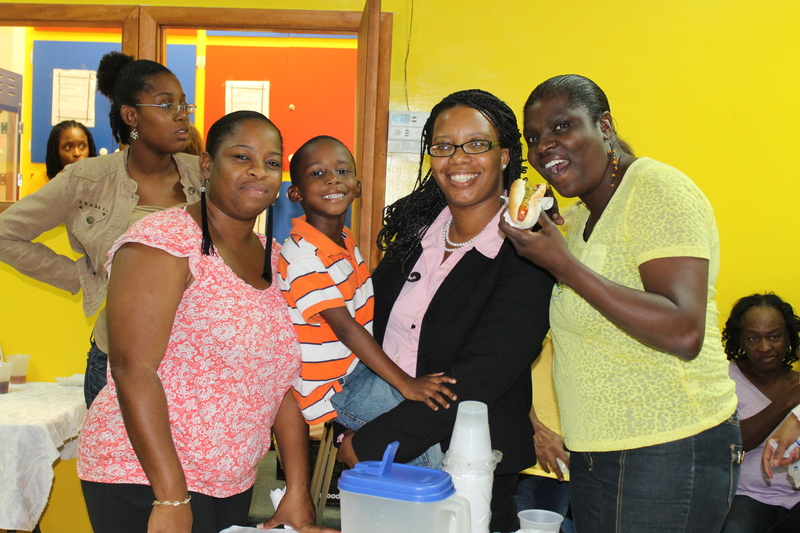 Kim Wallace (left), pictured with Tika Penn, supervised the decoration of the Centre for the celebration ceremony. She put in a LOT of time and effort into every detail. Her brother also donated a lot of his time and materials for making the ALC look really nice. Alfred Nahkla, Eric Nelson, Randy Grebe before the ceremony. The ALC ready for the celebration! 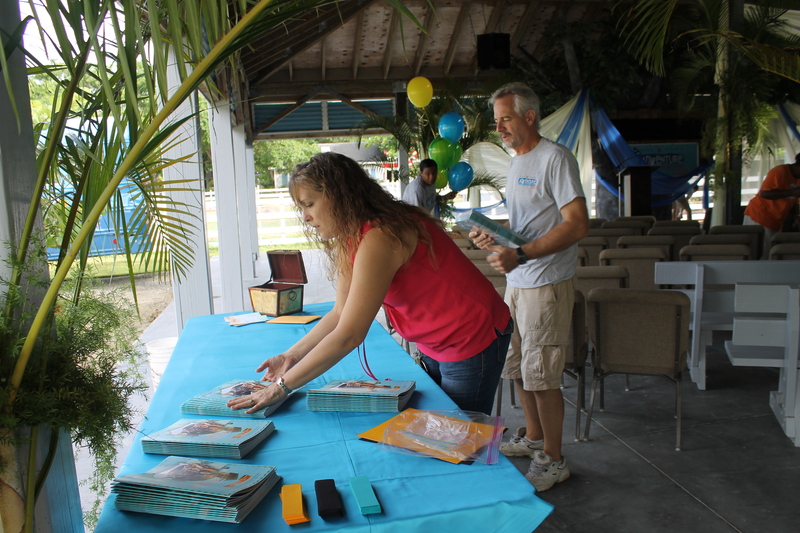 Guests started arriving and our job was to greet them and hand out the anniversary book. 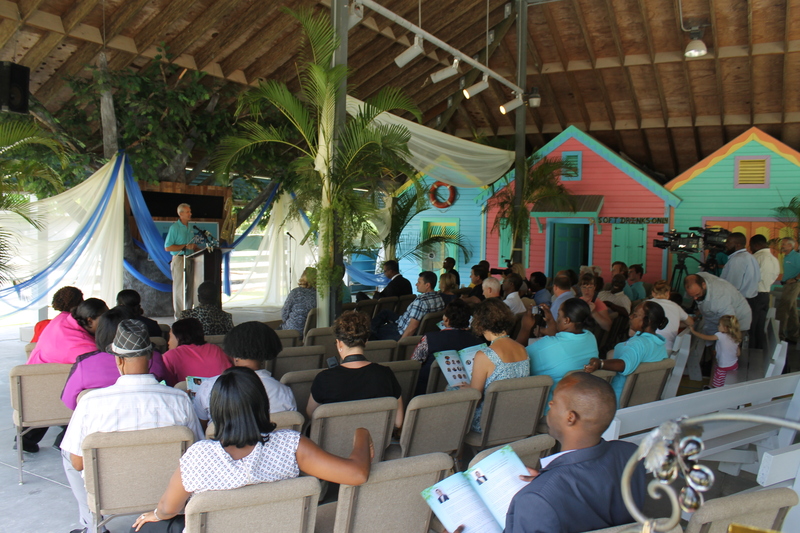 Ceremony opened in prayer by Pastor Cranston Knowles, one of our board members. 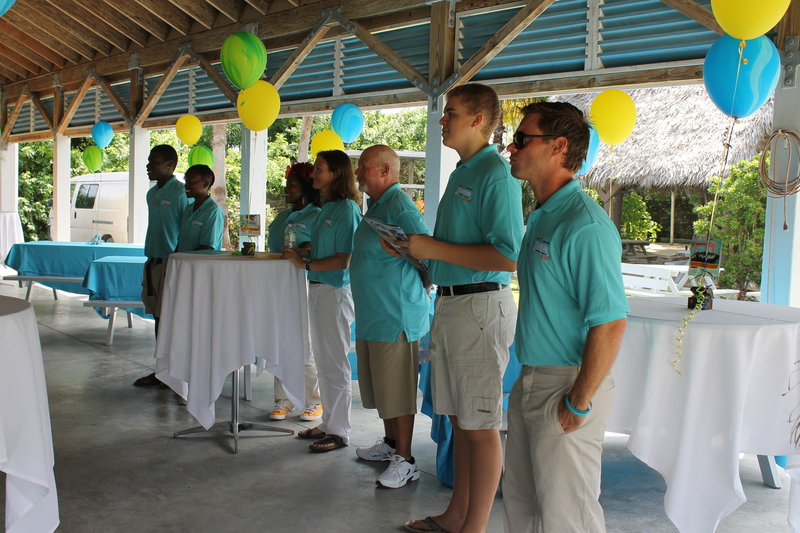 The ceremony began with the Bahamas national anthem. 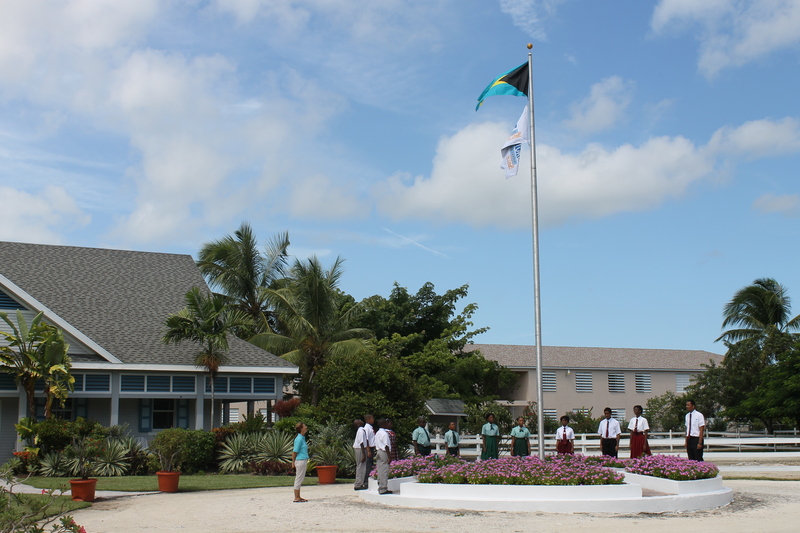 Three schools were invited to send children to the ceremony. After the national anthem, the ceremony began with a puppet show. The puppets sang the Celebration song. 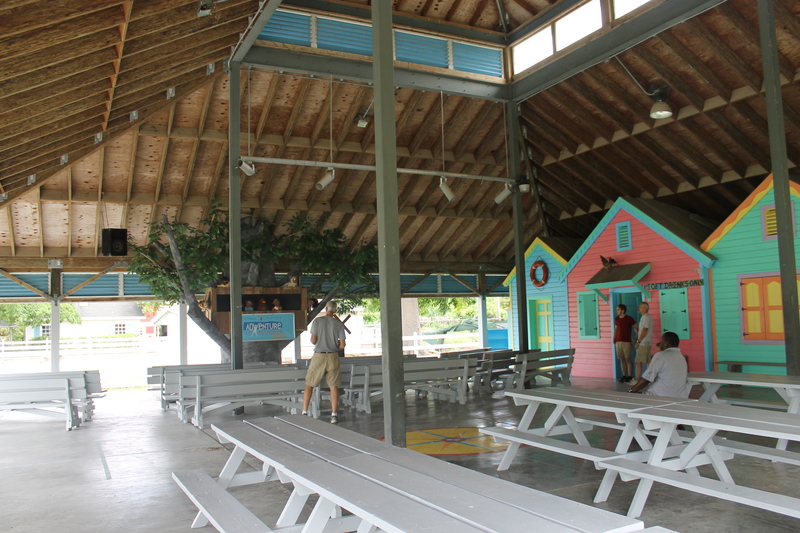 Following the puppet show, Mark Wallace addressed the crowd. In the audience were several media outlets. 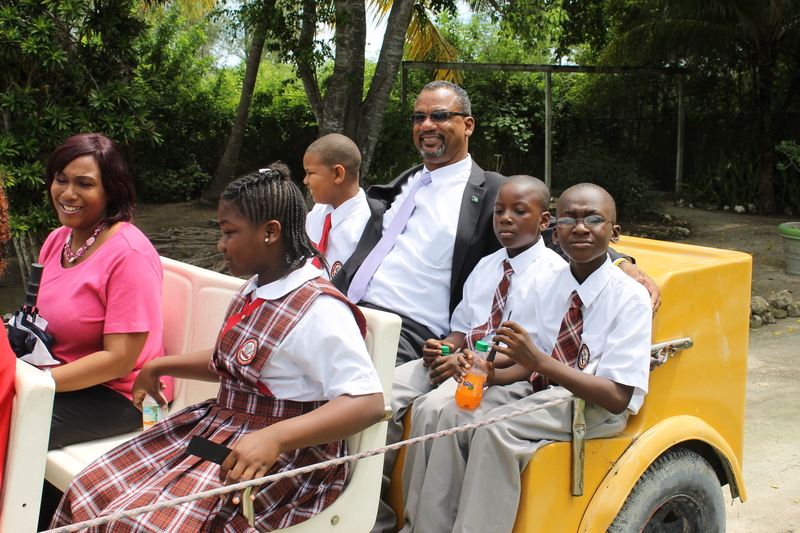 Minister of Education, Jerome Fitzgerald was in attendance. Some of our staff enjoying the ceremony from the back. 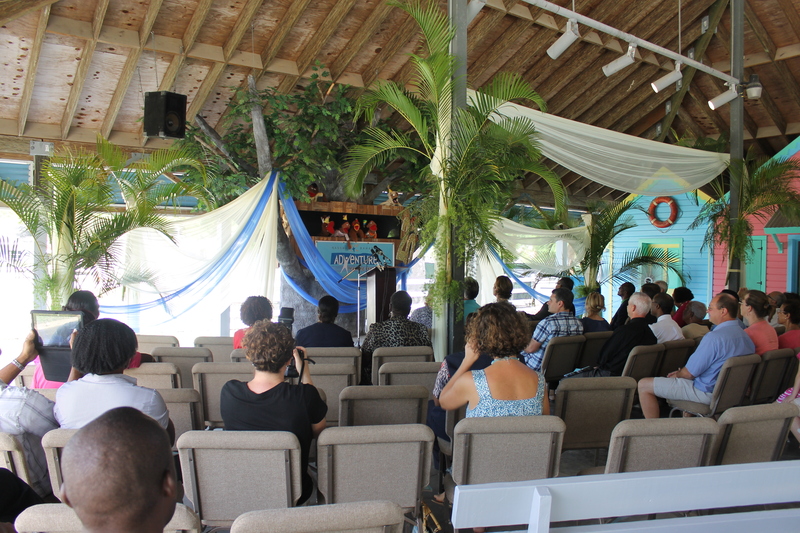 Part of the ceremony included dividing the audience into 3 groups and sending them to the three program areas to experience what the school children experience on a daily basis when they come to the Adventure Learning Centre. 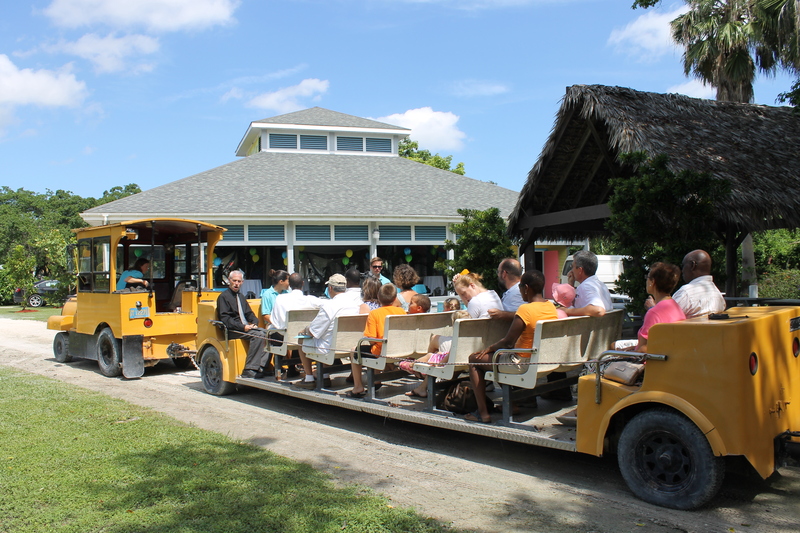 The three areas were the wetlands via the train, the planetarium, and the petting farm/nature center. 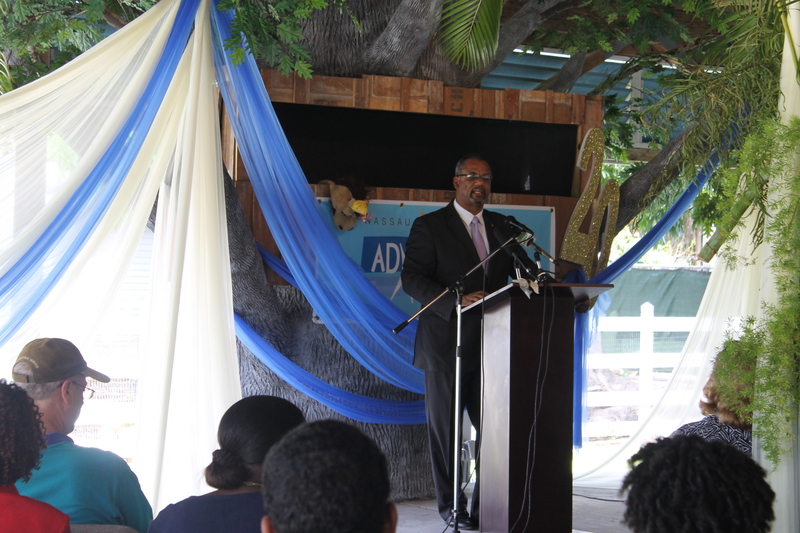 Minister of Education, Jerome FItzgerald, addressed the audience. Randy Grebe and Chet Lowe also addressed the audience. Minister FItzgerald with the children on the train. The ALC staff family! 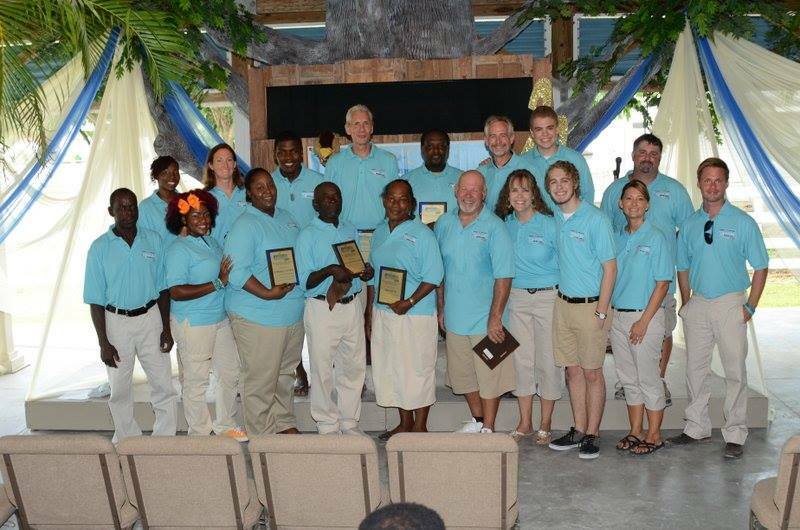 Several of the staff were honored for their many years of service. We feel so honored getting to be a part of this group and getting to serve our Lord together with these awesome people. 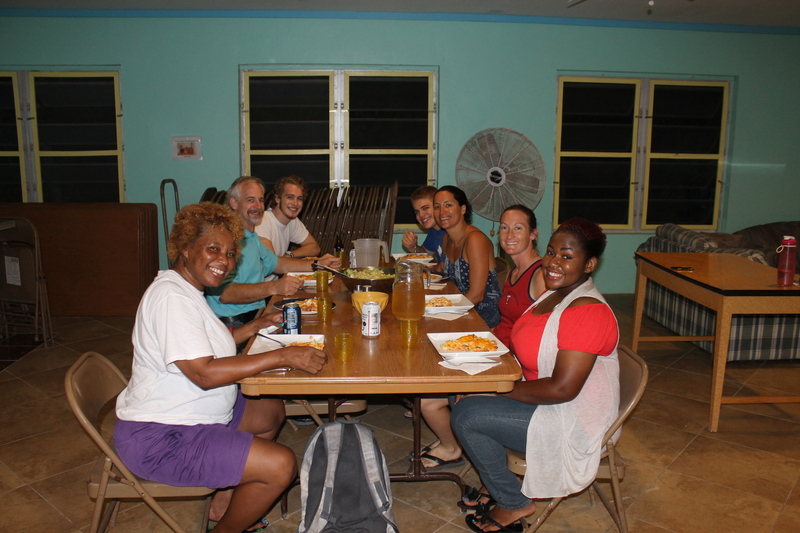 Friday evening, after cleaning up from the ceremony and setting up for the Funday to be held on Saturday, some past facilitators hosted a meal at the camp for everyone. 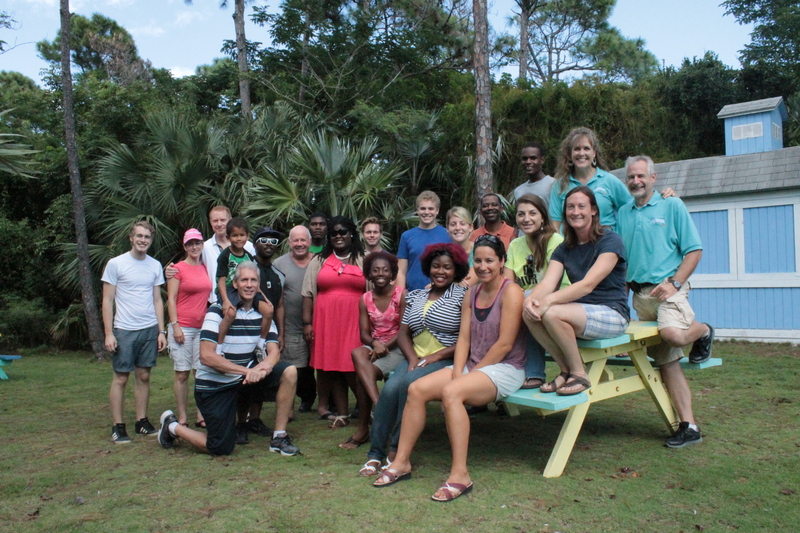 Everyone staying at camp: along with our staff are Paul and Beth Hadley, Humphrey and Marilyn Duncanson,, Alfred and Maria Nakhla, Nate Kaiser, Randy and Kim and Annika Grebe, Roger and Grace Grebe, and Jon and Annemieke. Every morning while they staid at camp, the guests attending the celebration activities would join us at our house for breakfast. 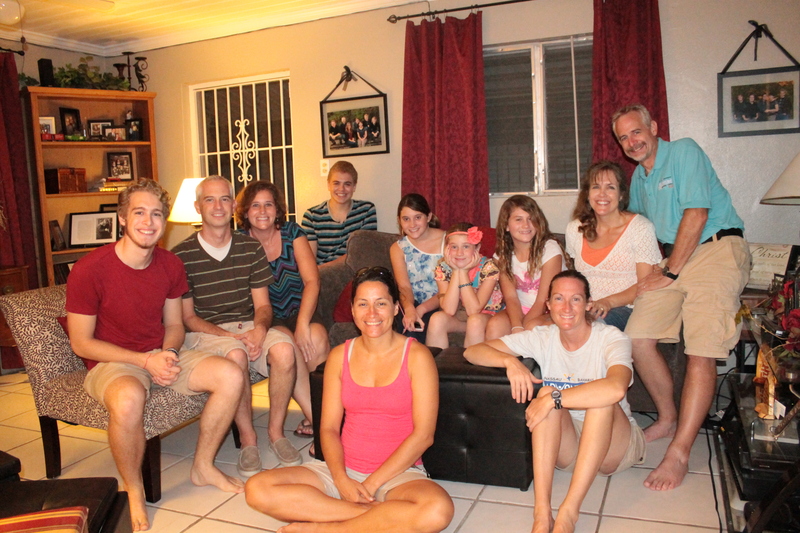 Since we knew these people from back in Wisconsin/Minnesota/Illinois, it was so much fun visiting with them. Breakfast at the Seeley’s house. 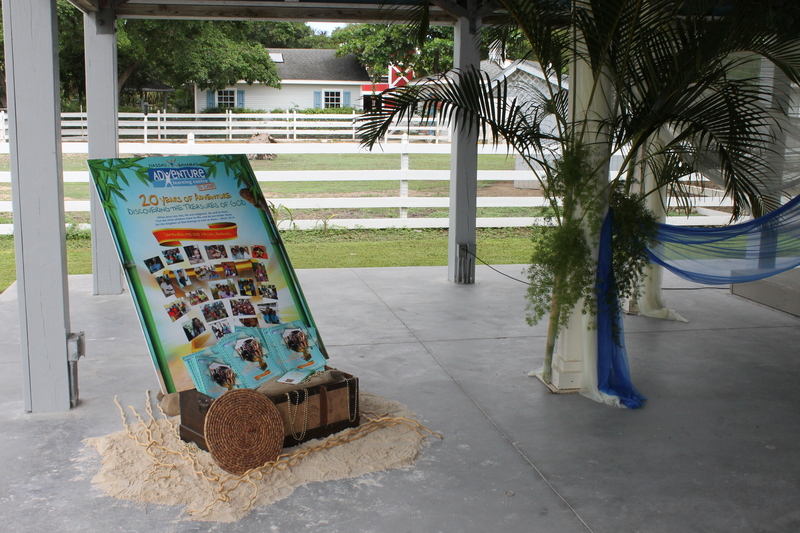 Friday after the ceremony and Saturday morning, the staff set up for a Funday. 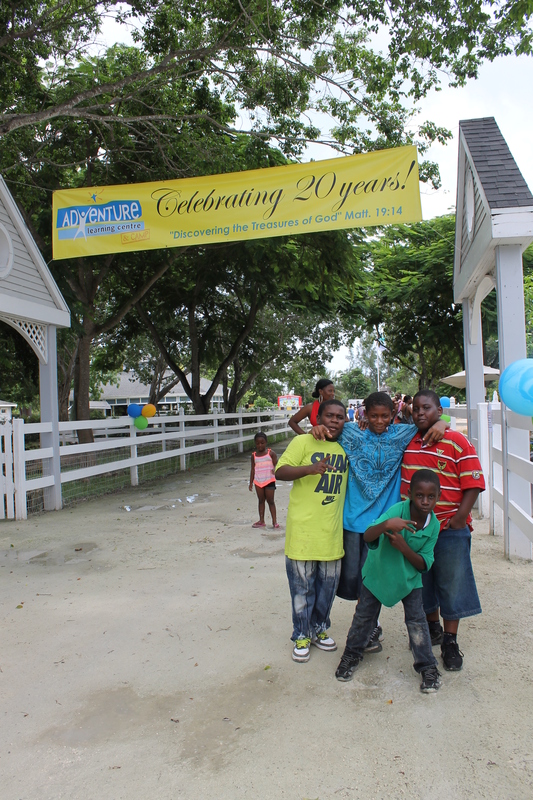 A Funday is a carnival of sorts that we use to help raise funds to operate the Centre. Although we had a great time, the turn out was low due to many factors including the weather. It was rainy much the day. 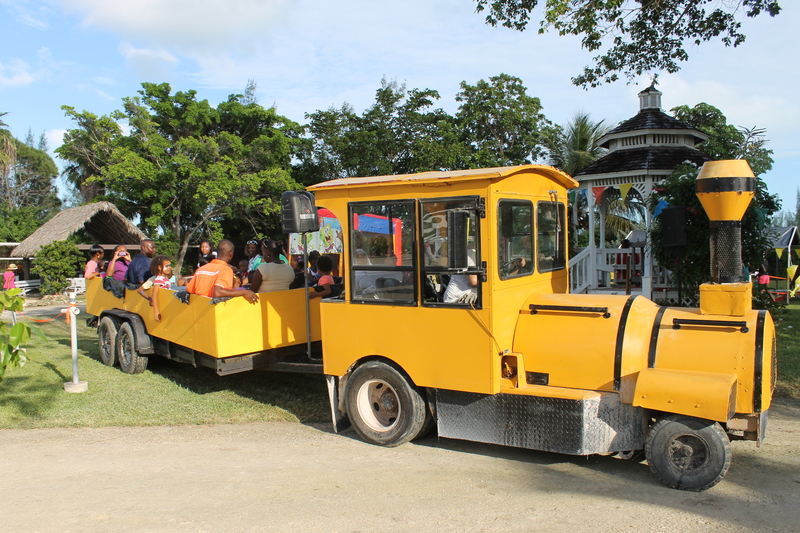 One of the Funday activities is a skit of sorts that coincides with the train ride. 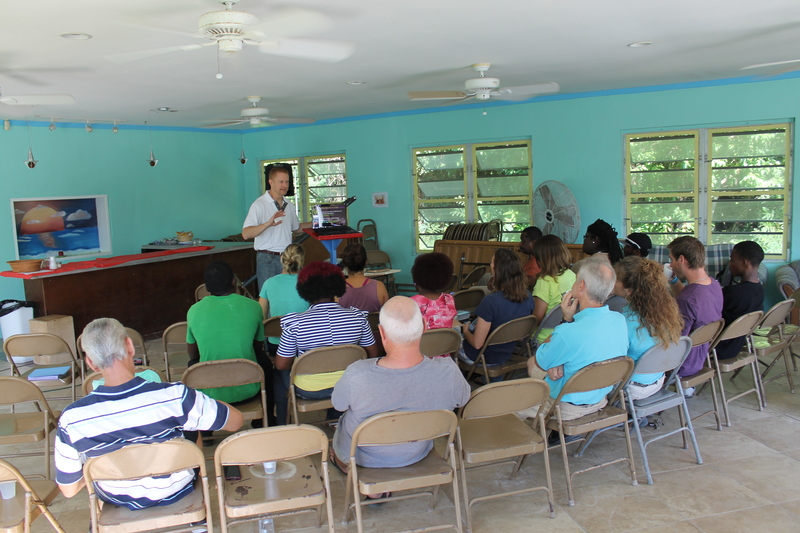 This is where the gospel is presented to the guests. Tika Penn was in charge of the skit this year, and she did a fantastic job telling the story of Creation, man’s fall into sin, and the redemptive work of Jesus Christ! Way to go Tika! 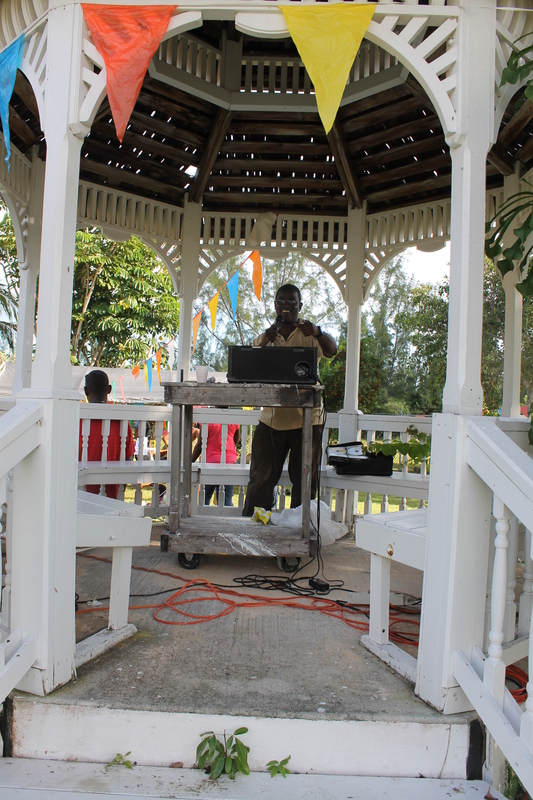 Music provided by a DJ! Ms. Aida’s awesome chicken wings were among the food items available. 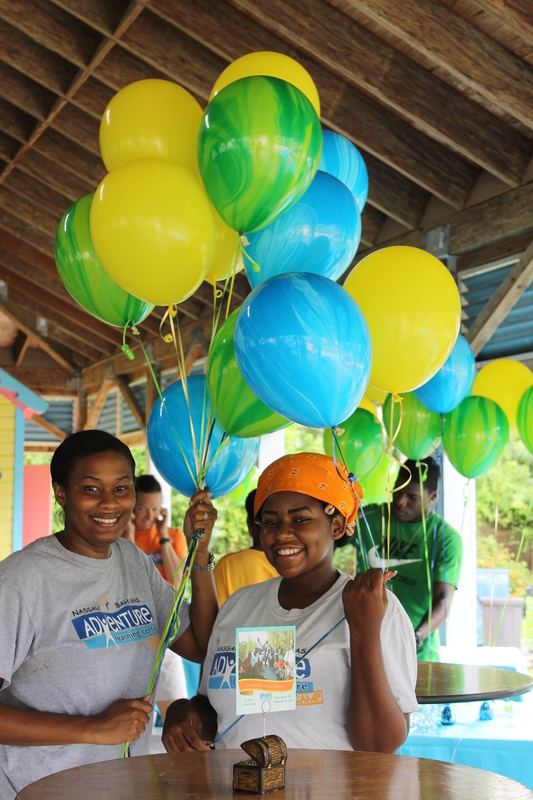 Our pastor’s wife and daugther, Alexine and Abby Moss, were among the many volunteers that helped us man the activities of the Funday. 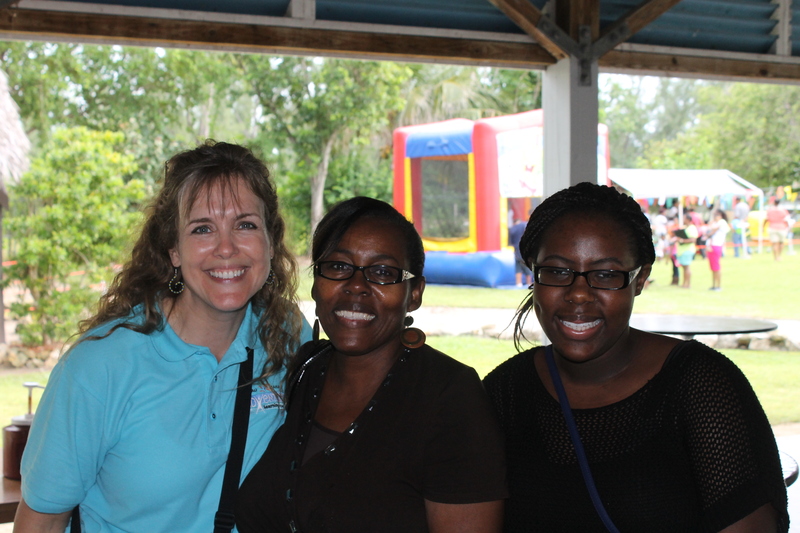 Although the rain dampened things a bit, the 580 people that did come out for the Funday seemed to have a great time. Randy and Kim Grebe introduced us to this young man. This young man laid one of the first blocks in the construction of the ALC back over 20 years ago. We would like to publicly thank all the people that came out to help us celebrate and to help serve the community for the Funday. We could not have done it without you! We feel so honored that God has allowed us to be a part of this awesome ministry. 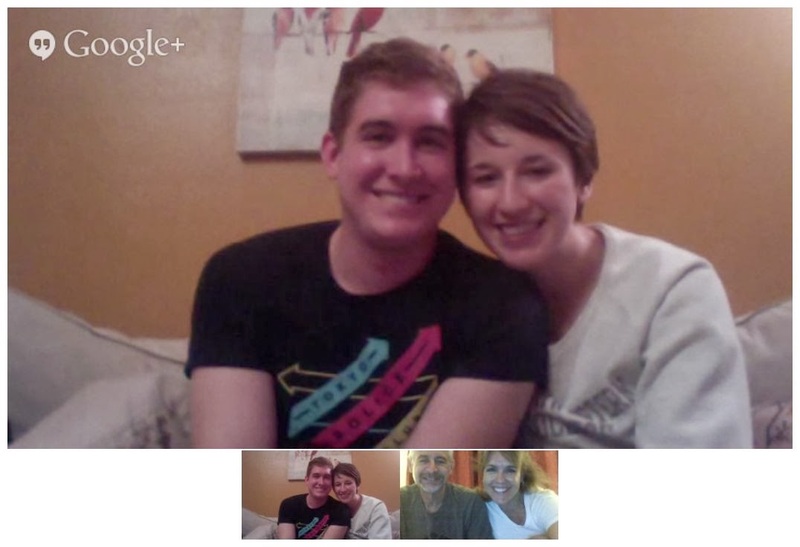 Although we have been here for only part of one year, we feel very attached to this ministry and the people it serves. 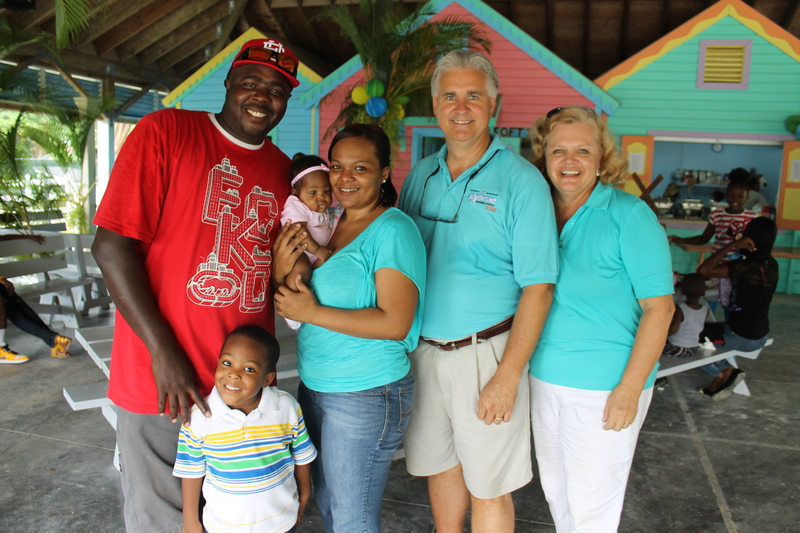 We love the Bahamian people, and we hope and pray, as Jesus tarries, that we will be able to serve Him here for many years to come. Please pray for the ministry and for all of the ALC&C staff. Most of all, please pray for the people we serve. God has brought us all here to this ministry for one reason, and that is to serve and bring glory to HIm. May Christ be glorified in deed! **Stay tuned for the third and final post this weekend. We will be doing a general update of what is going on at the centre and camp and what will be coming up in the next couple of weeks. We told you we had a lot of ground to cover this week. We hope you have enjoyed the journey!